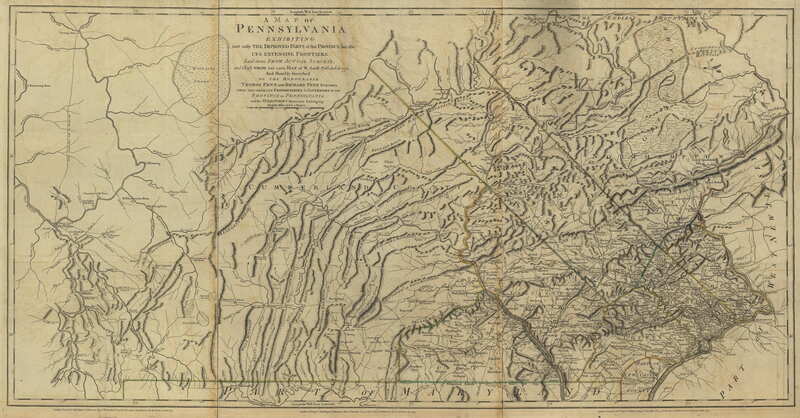 1775.1 A MAP OF PENNSYLVANIA EXHIBITING NOT ONLY THE IMPROVED PARTS OF THAT PROVINCE BUT ALSO ITS EXTENSIVE FRONTIERS: Laid down from actual surveys and chiefly from the late map of W. Scull published in 1770; and humbly inscribed to the Honourable Thomas Penn and Richard Penn... London. Printed for Robt. Sayer & J. Bennett, 1775. This version of William Scull's 1770 map (1770.1) was published separately and appeared in Thomas Jeffreys' The American Atlas published by R. Sayer & J. Bennett 1776 and later. 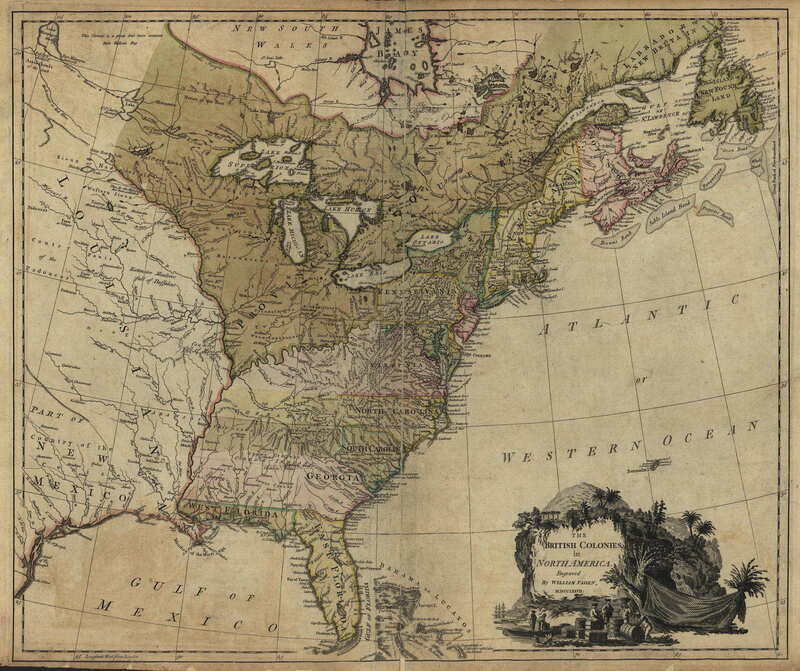 It also appeared in William Faden's North American Atlas of 1777 which is the image here from the Library of Congress. The same image was used for map 1770.1 and the only difference between the two is in the title. Sellers & van Ee #1296, Phillips page 674. Scale: 1 inch = 6 miles. Size: 28 x 52 inches. 1775.2 NORTH AMERICA FROM THE FRENCH OF MR. D'ANVILLE IMPROVED WITH THE ENGLISH SURVEYS MADE SINCE THE PEACE, London printed for Robt Sayer & J. Bennett, Map and Printsellers, No. 53 Fleet Street, as the act directs 10 June 1775 (McCorkle #775.2). This map is from The American Atlas by Thomas Jefferys et al, published by Sayer & Bennett London 1776, see page 585 in Phillips. It was published posthumously as Jefferys died in 1771 (Lister). The map originally appeared in 1755 (map 1755.5) and there were several versions. Jean Baptiste d'Anville was a French cartographer published by Sayer & Bennett who died in 1782. The 'peace' in the title refers to the French & Indian war which ended circa 1763. The state extends to the 43rd parallel and includes Delaware as a county. The east coast is shown in this closeup . Longitude is west from London at bottom, west from Ferro at top. The map is printed on two sheets joined along the vertical centerline. Blank verso. Scale: 1 inch = 100 miles. Size: 18 x 20 inches. 1775.4 A MAP OF THE PROVINCE OF NEW YORK WITH PART OF PENSILVANIA, AND NEW ENGLAND, from an actual survey by Captain Montresor, engineer, 1775. Publish'd as the Act directs, June 10th. 1775, by A. Dury, Dukes Court St. Martins Lane London. P Andrews sculp. Despite the title this two-sheet map includes only the northeastern tip of Pennsylvania on the bottom sheet. The map also appeared in William Faden's North American Atlas published in 1777, which is the image shown here from the Library of Congress. There is also a 1777 French version by Le Rouge. John Montresor was an officer in the British Army and its chief engineer in America. He was a friend of the famous painter John Singleton Copley, a Loyalist, who did a portrait of him now in the Detroit Institute of Arts. In the portrait Montresor holds a copy of Field Engineer, a textbook of the time. McCorkle #775.9, Sellers & van Ee #1066, Phillips page 675, Guthorn (1972) #144-4. 1775.6 To the Merchants & Insurers of the City of Philadelphia this CHART OF THE DELAWARE BAY AND RIVER, containing a full and exact description of the Shores, Creeks ... and bearings of the most considerable landmarks ... from the capes to Philadelphia ... is dedicated by a friend to trade and navigation Joshua Fisher 1775. This is Fisher's initial publication of his navigation chart and it was followed by a host of copies from 1776 on by Faden, Le Rouge, Sayer & Bennett, etc. 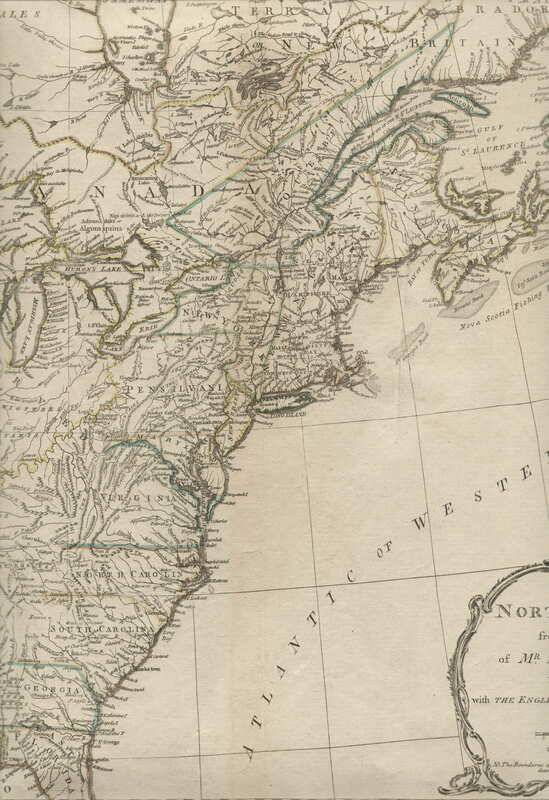 The image here is from Faden's North American Atlas of 1777 from the Library of Congress. This version appeared in The Gentleman's Magazine for July 1779. See Sellers & van Ee #1353-60, 1363-65,1372-73; Docktor #280H5. 1775.7 MAP OF THE PROVINCE OF PENSILVANIA. This undated and anonymous map is thought to be from the Gentleman's Magazine, London, circa 1775, although the general appearance could date it to the 1760's. The southern boundary reflects the Mason-Dixon survey (1768), though the western boundary is placed just west of Pittsburgh; the northern boundary is not marked. The map has a number of reference points that likely refer to companion text and appear to be connected to boundaries. The western and southern boundaries are marked Q, R, S, for example. A diagonal line runs from the Susquehanna R to Lake Erie P. A broken line marked by many letters A, B, N, O, etc., appears in the east. No latitude or longitude markings, blank verso. Scale: 1 inch = 55 miles. Size: 4.5 x 7.5 inches. 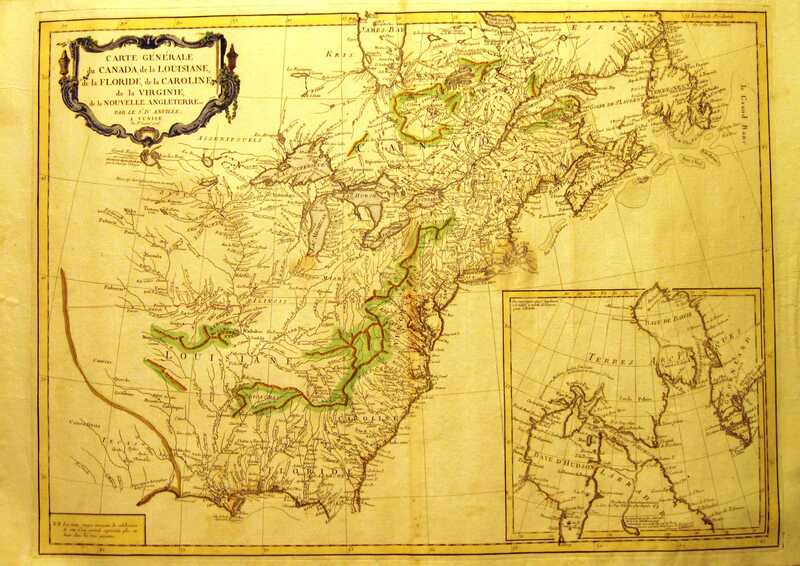 1775.8 A NEW & ACCURATE MAP OF NORTH AMERICA; from the best authorities. Engraved by J. Cary. Published by Jas. Ma?wan & Wm. Davis. This map is a direct copy of map 1766.1 and engraved by the well known English mapmaker John Cary (circa 1754-1835). Cary was most active right around the turn of the century so this map is likely one of his earliest cartographic efforts. Its source and exact dating are not known, but it is probably circa 1775, when Cary would have been around 20 years old, and may be from a later edition of John Entick's The General History of the Late War, first published in 1766, and also in 1775 and 1779. The rough bottom shows it was removed from a book. The map shows the eastern United States and southern Canada south to a cutoff Florida and west to beyond the Mississippi. Pennsylvania extends north to the 43rd parallel with Venango, Bufflers T., Pitsburg, Wyoming, Ft. Granville, and Philadelphia named. The coloring on this copy is probably not original. Longitude west from London, blank verso. Scale: 1 inch = 265 miles. Size: 7.75 x 9 inches. 1776.1 A MAP OF THE COUNTRY ROUND PHILADELPHIA INCLUDING PART OF NEW JERSEY NEW YORK STATEN ISLAND & LONG ISLAND, from the September, 1776, issue of Gentlemen's Magazine, London for D. Henry. 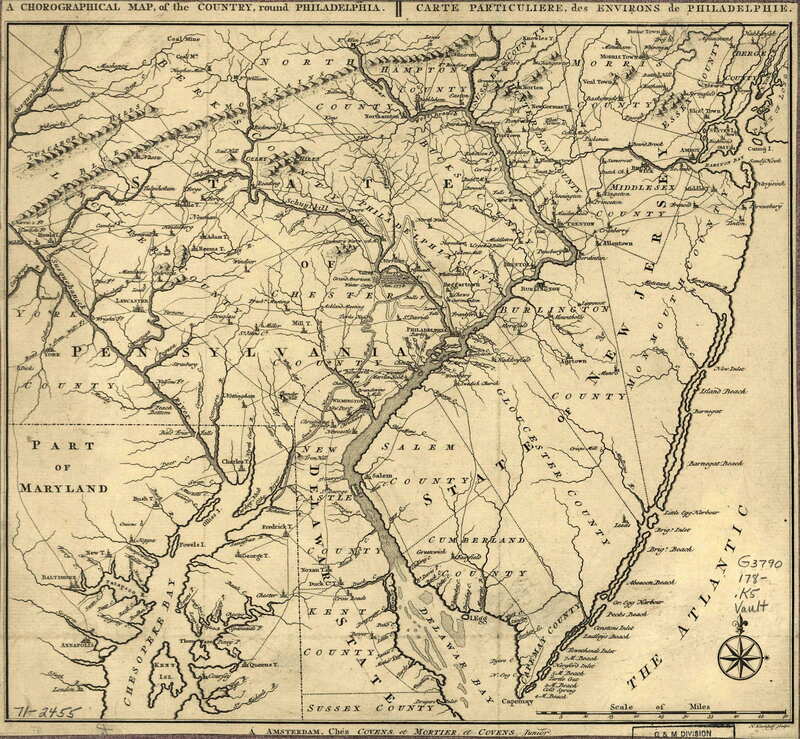 The map shows Pennsylvania west to York and north to include most all of New Jersey. The title would imply that Philadelphia was more important than the entire state of New Jersey, which was probably true at the time. The same map with only slight differences appeared in The Scots Magazine, Edinburgh, A. Murray 1776. Phillips page 676, 699. Longitude west from London, blank verso. Scale: 1 inch = 26 miles. Size: 7 x 8.75 inches. 1776.3 THE THEATRE OF WAR IN NORTH AMERICA, with the roads, and tables, of the superficial contents, distances, &ca. by an American. London. Printed for Robt. Sayer and Jno. Bennett, No. 53 Fleet Street, as the Act directs 20th Novr. 1776. 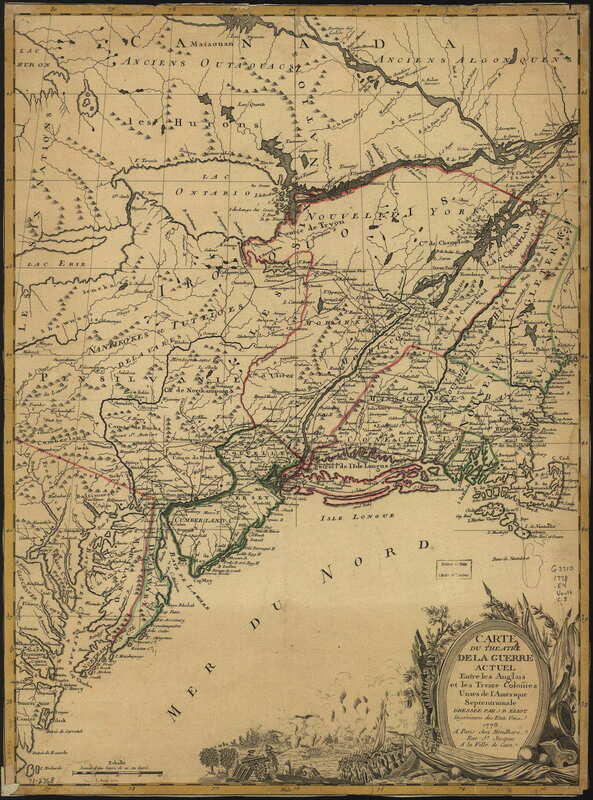 This map, of the familiar region from Newfoundland to Florida and west to the Mississippi, was orginally published as a broadside with three columns of text below the map. McCorkle illustrates five states of this map: 776.2, 776.15, 776.26; Sellers & van Ee #144-45, 160. The table mentioned covers a large portion of the map and is titled Evan's Polymetric Table of America. One of the broadside versions of this map is also illustrated in Pritchard & Taliaferro #54. 1776.4 CARTE GENERALE DU CANADA, DE LA LOUISIANE, DE LA FLORIDE, DE LA CAROLINE, DE LA VIRGINIE, DE LA NOUVELLE ANGLETERRE, ETC. par le Sr. D'Anville, a Venise, par P. Santini 1776 chez Mr. Remondini. This map covers the eastern United States to beyond the Mississippi and is a later upgrading of D'Anville's original 1755 map published in Santini's Atlas universel, 1776. McCorkle #776.3, Seller & van Ee #136-37. Image from the Heritage Map Museum CD by permission. 1776.7 A GENERAL MAP OF THE NORTHERN BRITISH COLONIES IN AMERICA. 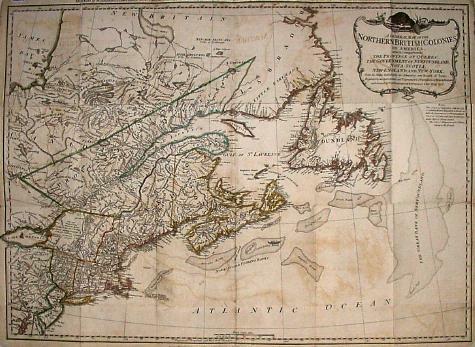 which comprehends the Province of Quebec, the Government of Newfoundland, Nova-Scotia, New-England and New-York...; with a title above the border THE SEAT OF WAR IN THE NORTHERN COLONIES, CONTAINING THE PROVINCE OF QUEBEC, NEWFOUNDLAND, NOVA-SCOTIA, NEW-ENGLAND, NEW-YORK, NEW-JERSEY, PENNSYLVANIA, &CA. London Printed for R. Sayer & J. Bennett... 1776. Pennsylvania just makes it onto the bottom left edge of this map of eastern Canada. 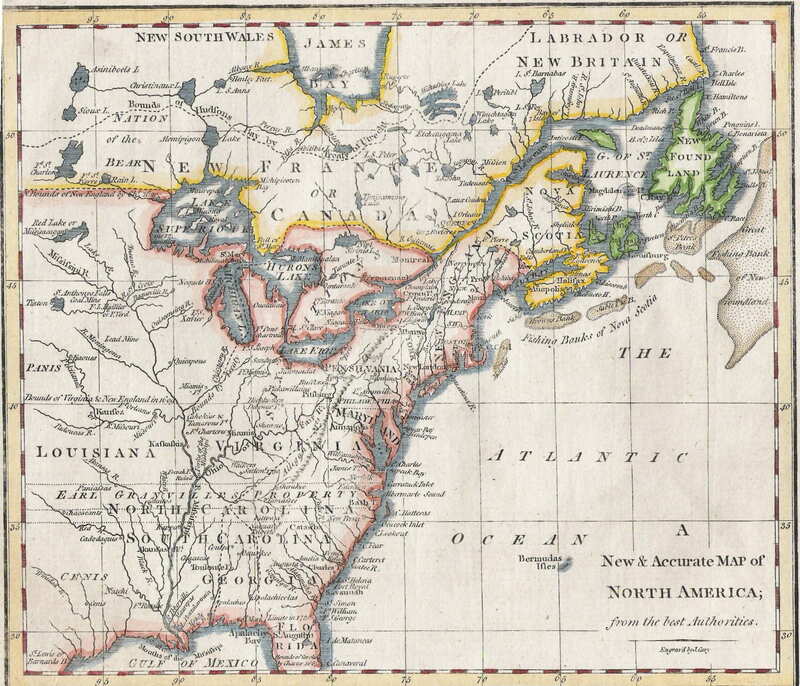 McCorkle (#776.11, 794.12) illustrates 1788, 1794 versions also where the map is retitled A NEW AND CORRECT MAP OF THE BRITISH COLONIES IN NORTH AMERICA. This map, and the one below, also appeared in the American Military Pocket Atlas, intended for use by British officers in the field. Sellers & van Ee #143. Image from the Heritage Map Museum CD by permission. 1776.8 A GENERAL MAP OF THE MIDDLE BRITISH COLONIES IN AMERICA. containing Virginia, Maryland, the Delaware Counties, Pennsylvania and New Jersey...; with a title above the border THE SEAT OF WAR IN THE MIDDLE BRITISH COLONIES, CONTAINING VIRGINIA, MARYLAND, THE DELAWARE COUNTIES &CA. London Printed for R. Sayer & J. Bennett... 1776. This is the companion map to the one above, and contains an inset of the western Great Lakes. The main map shows the region from New York to Virginia and west to include Ohio. All of Pennsylvania is shown, and the southeastern portion is included in a detail from the map in Ristow. This image is from the Library of Congress. 1776.13 A MAP OF THE MIDDLE BRITISH COLONIES IN NORTH AMERICA. First published by Mr. Lewis Evans, of Philadelphia, in 1755; and since corrected and improved, as also extended, with the addition of New England, and bordering parts of Canada, from actual surveys now lying at the Board of Trade. By T. Pownall MP. with a topographical description of such parts of North America as are contained in this map. Printed & published according to Act of Parliament for J. Almon in Piccadilly, London. March 25th. 1776. Engraved by Jas. Turner in Philadelphia. 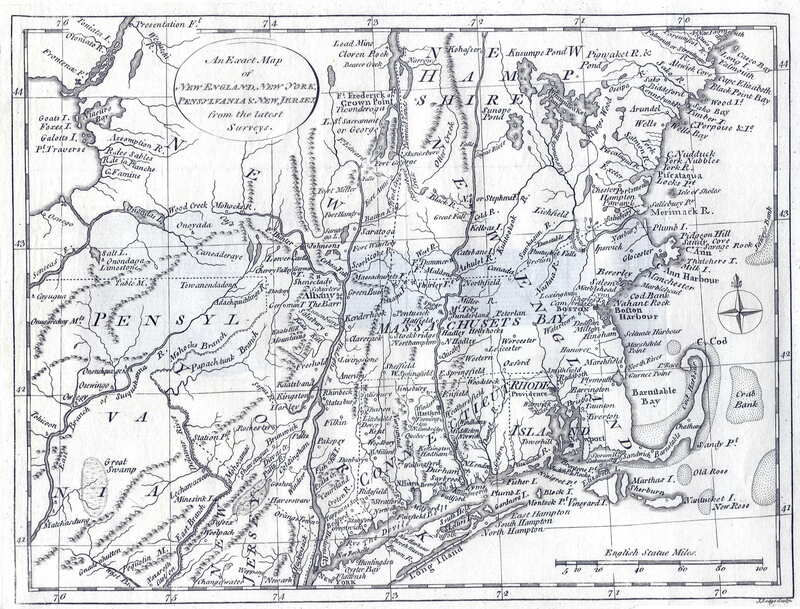 This was a major revision of Evans' map which was extended to include New England up to Maine. The map was accompanied by A Topographical Description of such parts of North America as are contained in the (annexed) Map... . This reprinted much of Evans' Analysis... augmented by Pownall. In 1784, Pownall prepared a manuscript of a new edition that was never published. The manuscript came into the possession of William Darlington, who founded the Darlington Memorial Library at the University of Pittsburgh, and was published in 1949 by the university. It was accompanied by a facsimile of this 1776 map with revisions marked by Pownall, and by a facsimile of Bernard Roman's A General Map of the Southern British Colonies in America. McCorkle #776.24, Sellers & van Ee #710. This image is from the Library of Congress. 1776.14 A MAP OF THE PROVINCE OF NEW YORK, reduc'd from the large drawing of that Province, compiled from actual surveys by order of His Excellency William Tryon Esqr. Captain General & Governor of same, by Claude Joseph Sauthier; to which is added New-Jersey, from the topographical observations of C. J. Sauthier & B. Ratzer. Engraved by William Faden, (successor to the late Mr. Thos. Jefferys) 1776. London, publish'd according to Act of Parliament, August 1st. 1776, by Wm. Faden, corner of St. Martin's Lane, Charing Cross. The Pennsylvania boundary is set at the 42nd parallel with the note "Bounds of Pennsylvania by Patent." The land to the north in New York is called Country of the Six Nations, and the Penns ceded the land to the 43rd parallel to New York largely to avoid having to deal with the Iroquois. The road network in southeastern Pennsylvania is illustrated on this map. This image is from the Libray of Congress. McCorkle #776.25, Sellers & van Ee #1047. 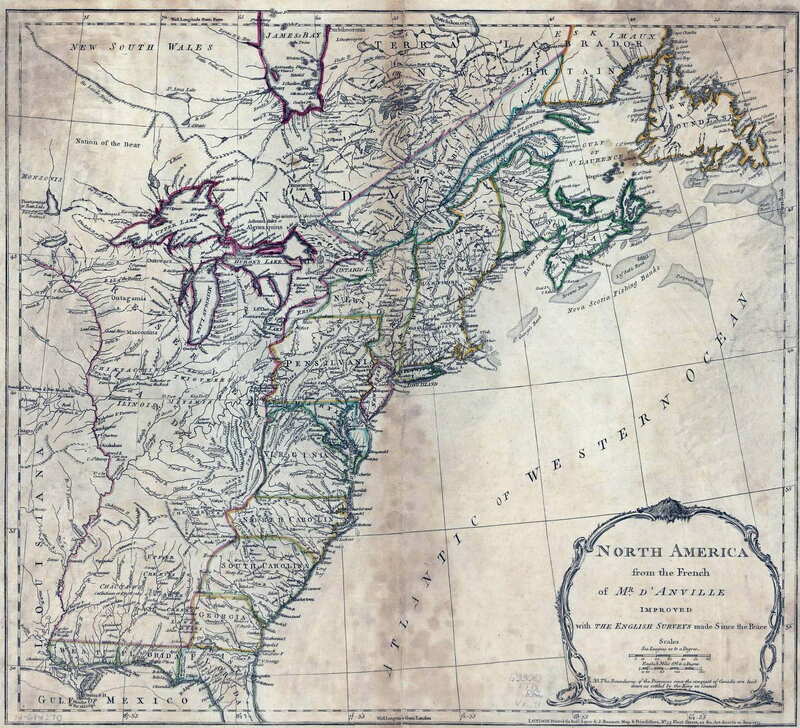 1776.15 A GENERAL MAP OF NORTH AMERICA; from the latest observations. Printed according to Act of Parliament, Jany. 27th 1776. Engraved by Jn. Lodge from the late Mr. Jeffrys geographer to the King. This is a modification of map 1776.3 with Florida now cutoff and a modified tables of distances. McCorkle #776.15, 777.11; Sellers & van Ee #160. 1776.16 A PLAN OF THE CITY OF PHILADELPHIA, THE CAPITOL OF PENNSYLVANIA, from an actual survey. By Benjamin Easburn, Surveyor General; 1776. London, Andrew Drury, 1776. 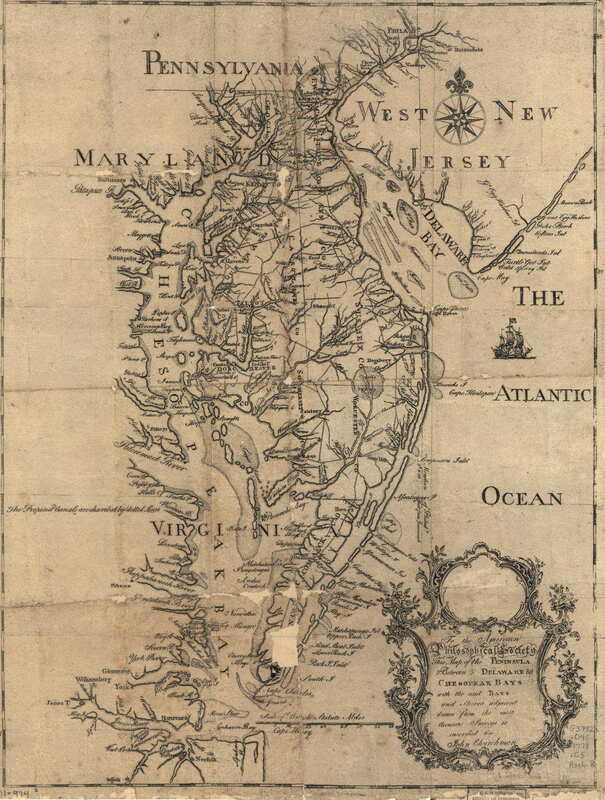 This map contains an inset of Fisher's Delaware Bay map. Illustrated on pages 120-21 of Nebenzahl & Higginbotham, and an excellent reproduction is in van Erman and in M. P. Snyder, Figure 42. There was a contemporary French version PHILADELPHIE, PAR EASBURN... by Le Rouge which is shown in this image from the Library of Congress, however it lacks the Fisher inset. Although this map is attributed to Benjamin Eastburn, he had nothing to do with it, and even his name is spelled wrong. It is actually a copy of map #1762.3, see M. P. Snyder, page 96. Sellers & van Ee #1312-13, Phillips page 699, Guthorn (1972) #144-6. 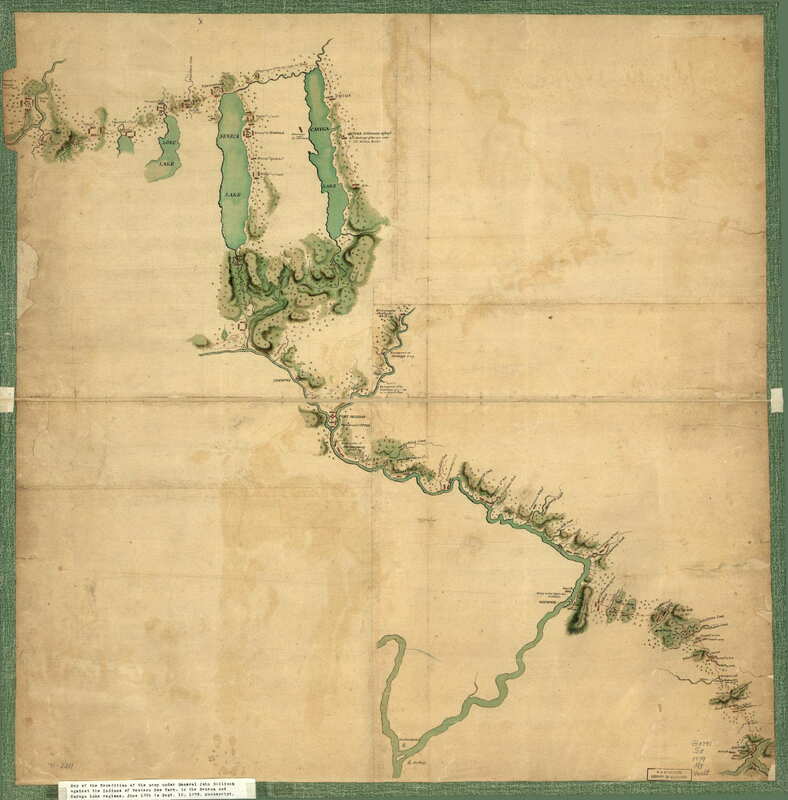 1776.17 (Western Pennsylvania) This is an untitled manuscript map, possibly a fragment, showing the Ohio River from Pittsburgh to south of Wheeling. It is attributed to John Montresor, a British army engineer and the original is in the Library of Congress. It is illustrated in Brown #50 and is probably the map listed by Docktor #276M1. 1776.18 (Delaware and Chespeake Bays) An untitled anonymous manuscript map of the Delaware and Chesapeake region showing roads. Listed in Phillips page 675 dated 177_, dated 1776 at the Library of Congress where this image comes from. This map could also possibly be the one listed on page 677 of Phillips dated 178_? As with the French & Indian War, there are a number of Revolutionary War anonymous manuscript maps prepared by soldiers on both sides showing aspects of the Philadelphia campaign, see Docktor #276A2, 27_A5.0A, #27_A5, #27_A7. 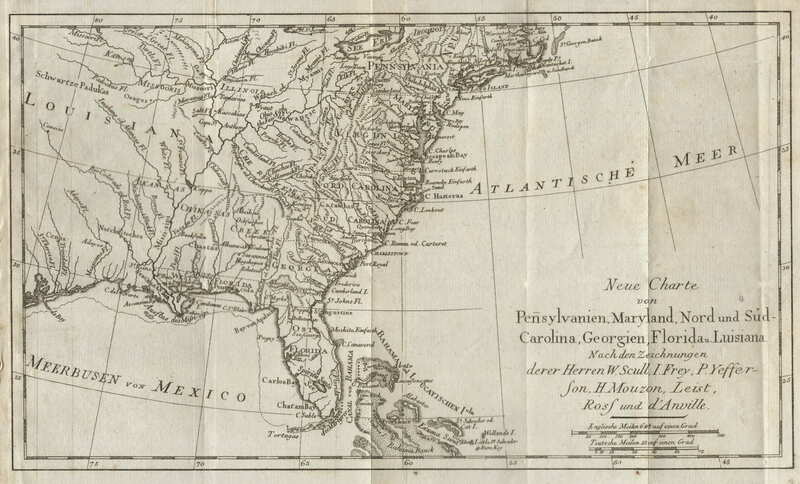 1777.1 NEUE CHARTE VON PENSYLVANIEN, MARYLAND, NORD UND SUD CAROLINA, GEORGIEN, FLORIDA U. LUISIANA. NACH DEN ZEICHNUNGEN DERER HERREN W. SCULL, I. FREY, P. YEFFERSON, H. MOUZON, LEIST, ROSS UND D'ANVILLE. This is an anonomous German edition of a map probably originally by D'Anville who died in 1782 (Lister), and the dating is uncertain. The W. Scull map appeared in 1770 which places an early bound and preparation probably predates the early 1780's because the name United States does not appear; the colonies are named individually. The sources for the map are listed in the title and these names appear in maps from Faden's North American Atlas of 1777, so this map likely dates circa 1775-80. Despite the German title some features retain English spellings. The prime meridian is not identified but the longitude appears to be west from Ferro. Blank verso. Scale: 1 inch = 220 miles. Size: 7.5 x 12 inches. 1777.2 A NEW MAP OF THE BRITISH COLONIES IN NORTH AMERICA, shewing the seat of the present war, taken from the best surveys, compared with and imroved from manuscipts of several noblemen and gentlemen. By John Andrews. London. Publish'd according to Act of Parliament, Jany. 16th. 1777: by John Andrews, at Mr. Blisset's No. 29 Long Acre. and Andrew Dury in Duke's Court, St. Martin's Lane, Charing Cross. Drawn & Engraved by John Andrews. Pennsylvania ends at 42 degrees on this detailed map of the east coast and west to Lake Michigan. There is also a 1781 version. McCorkle #777.1, 781.1; Sellers & van Ee #146-48, Guthorn (1972) #138. 1777.4 CARTE DU THEATRE DE LA GUERRE ENTRE LES ANGLAIS ET LES AMERICAINS: dressee d'apres les cartes Anglaises les plus modernes, par M. Brion de la Tour, Ingenieur-Geographe du Roi. 1777 A Paris chez Esnauts et Rapilly, rue St. Jacques a la Ville de Coutances. This map includes only eastern Pennsylvania shown with its present boundaries. The image is from the Library of Congress. McCorkle #777.6, 778.1, 779.3, 782.8; Sellers & van Ee #728-30. 1777.5 THE BRITISH COLONIES IN NORTH AMERICA. Engraved by William Faden, M.DCCLXXVII. This map comes from The North American Atlas published in London, 1777. It shows the familiar region from Newfoundland to Florida and west to beyond the Mississippi. The northern boundary of Pennsylvania is placed slightly above 42 degrees, and the western boundary slightly beyond the 80th meridian. There were subsequent versions, some illustrated by McCorkle #777.8, Sellers & van Ee #732-33, also illustrated in Fite & Freeman #59. This image is from the Library of Congress where all of Faden's atlas can be viewed. 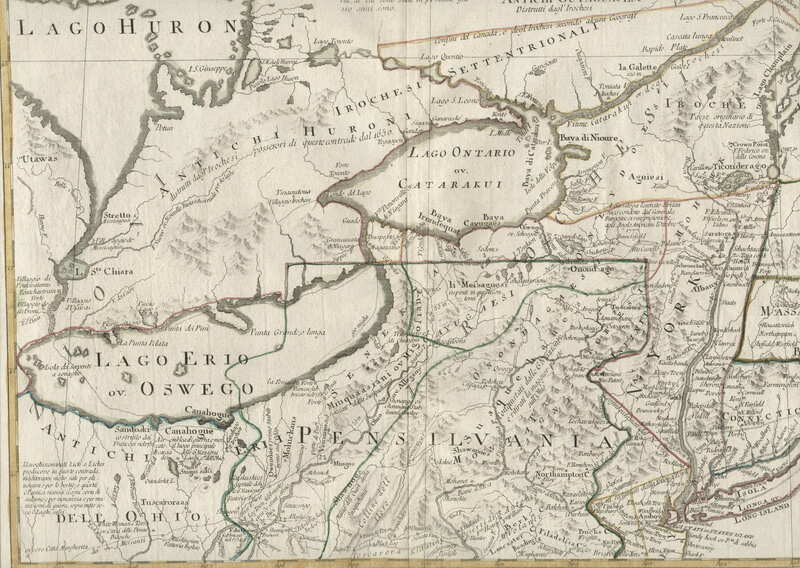 1777.7 PROVINCE DE NEW-YORK en 4 feuilles par Montresor. A Paris chez Le Rouge Ingr. Geog. du Roi rue des Grands Augustins 1777. This is the Le Rouge French version of map 1775.5, appearing in Le Rouge's Atlas ameriquain septentrional. McCorkle #777.16; Sellers & van Ee #1068. 1777.8 CARTE DETAILLEE DES POSSESSIONS ANGLOISES DANS L'AMERIQUE SEPTENTRIONALE construite d'apres les dernieres relations et les cartes particulieres de ces provinces, pour l'intelligence de la guerre actuelle entre les Anglois et leurs colonies. A Paris ches Esnauts et Rapilly, rue St. Jacques a la Ville de Constances. 1777. A French map of the eastern United States attributed to Rene Phelippeaux, with later states. This image is from the Library of Congress. McCorkle #777.18, 778.12, 779.11; Sellers & van Ee #150-51. 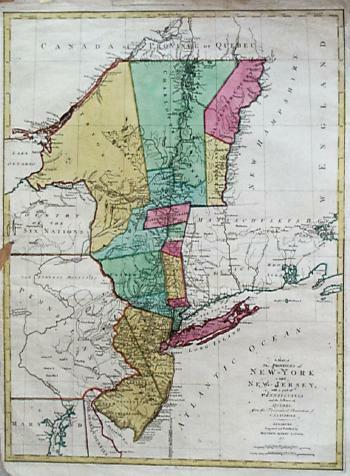 1777.9 A MAP OF THE PROVINCES OF NEW-YORK AND NEW-JERSEY, with a part of Pennsylvania and the province of Quebec. from the topographical observations of C. J. Sauthier. Augsburg engraved and published by Matthew Albert Lotter 1777. This is a German version of Sauthier's 1776.13 map of New York. 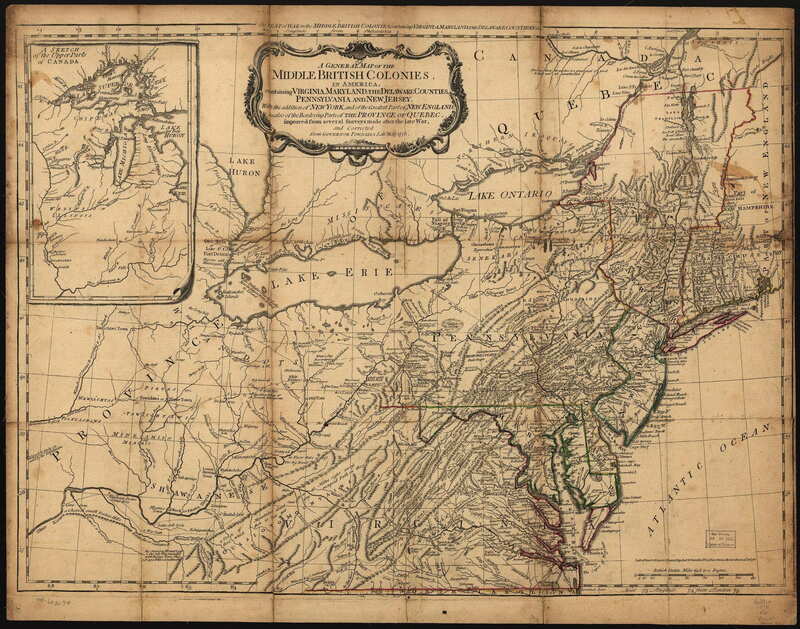 It is a two sheet map, with Pennsylvania included on the southern sheet with the title. The image shows the two sheets joined. McCorkle #777.20; Sellers & van Ee #1048. Image from the Heritage Map Museum by permission. 1777.10 THEATRE DE LA GUERRE EN AMERIQUE SEAT OF WAR IN AMERICA. This map of uncertain date and origin is oriented with northeast at the top, with a banner Supplement au Courier de L'Europe No. XXXII Vol. II, apparently a French publication. It includes northern Maryland, Delaware, eastern Pennsylvania, New Jersey, southern New York and parts of Connecticut, Massachusetts, and New Hampshire. Its intent is to show the theatre of the Revolutionary War around New York. This image is from the Library of Congress. McCorkle #777.21; Sellers & van Ee #731. 1777.11 CARTE NOUVELLE DES POSSESSIONS ANGLOISES EN AMERIQUE... Traduite de l'Anglois d'apres Thos. Gefferys, geographe du prince de Galles, revue et corrigee par M. Moithey... Avril 1777. This is a later version of a 1757 map (1757.2) with the title changed. McCorkle 777.10, 780.5; Sellers & van Ee #155-56). 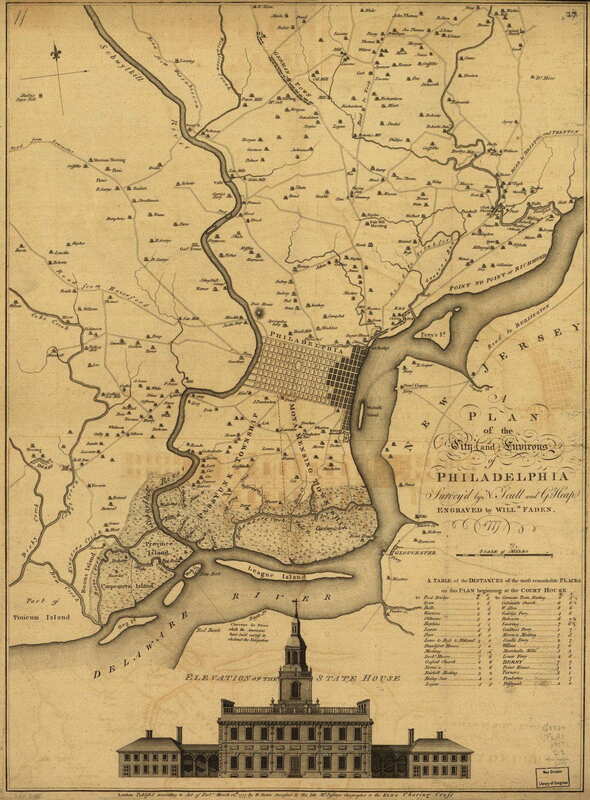 1777.12 SEAT OF WAR IN THE ENVIRONS OF PHILADELPHIA: By Thos. Kitchin, Senr. Hydrographer to his Majesty. For the London Magazine 1777. Printed for R. Baldwin at the Rose Pater Noster Row. This war map appeared in the London Magazine in 1777 and is illustrated in Fite & Freeman #67 and in Johnson (1974). It includes the area from Trenton to Lancaster and 30 minutes north and south of 40 degrees. The road network is shown in detail. It was likely published to illustrate the campaign against Philadelphia. Sellers & van Ee #1314, Phillips page 699. Longitude west from London, blank verso. Scale: 1 inch = 10 miles. Size: 7.5 x 10 inches. 1777.13 A SURVEY OF THE CITY OF PHILADELPHIA AND ITS ENVIRONS shewing the several works constructed by His Majesty's troops, under the command of Sir William Howe, since their possession of that city 26th. September 1777, comprehending likewise the attacks against Fort Mifflin on Mud Island, and until it's reduction. 16th November 1777. (Signed by) John Montresor Chief Engineer. P. Nicole Fecit. This is a manuscript map with several insets showing fortifications and this image is from the Library of Congress. Sellers & van Ee #1315. 1777.15 A PLAN OF THE CITY AND ENVIRONS OF PHILADELPHIA. Engraved and published by Matthew Albert Lotter. 1777. This is Lotter's version of the Scull & Heap map, apparently issued in both English and German versions per Seller & van Ee #1322. Image from the Heritage Map Museum CD by permission. 1777.16 (Philadelphia) An untitled map that appeared in editions of J. F. W. Des Barres Atlantic Neptune. It covers the area around Philadelphia and neighboring New Jersey and Delaware and was intended to show the navigable Delaware up to Trenton. 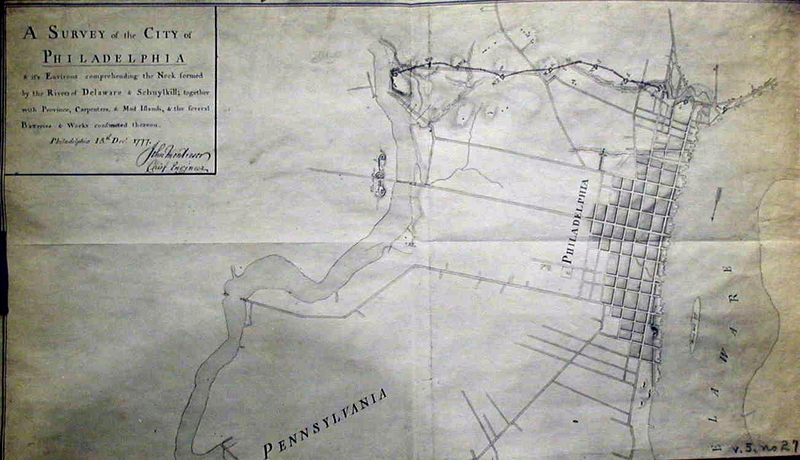 It is laid out like the 1687 Holme map, and there is a manuscript version in the British Library titled A MAPP OF PENSILVANIA IN AMERICA with inset titled THE CITY PHILADELPHIA; both are illustrated in M. P. Snyder, Figures 187, 188. Sellers & van Ee #1323; also see Docktor #279D2.02. 1777.17 BATTLE OF BRANDYWINE, 11TH SEPTR. 1777, in which the rebels were defeated by the Army under the command of Genl. Willm. Howe. The Library of Congress has five manuscript maps of this title concerning the Battle of Brandywine, Sellers & van Ee #1334-36, 1339-40, this is one of them. They were apparently used to prepare a published map of the same title by William Faden in 1778, although John Montresor is credited with the manuscript versions. The Faden engraved map is illustrated in M. P. Snyder, Figure 189. For several manuscript maps on Brandywine, see Docktor #277W2, #277W5, #277R7, #277W2.0A - 0B; and Guthorn (1972) #132. 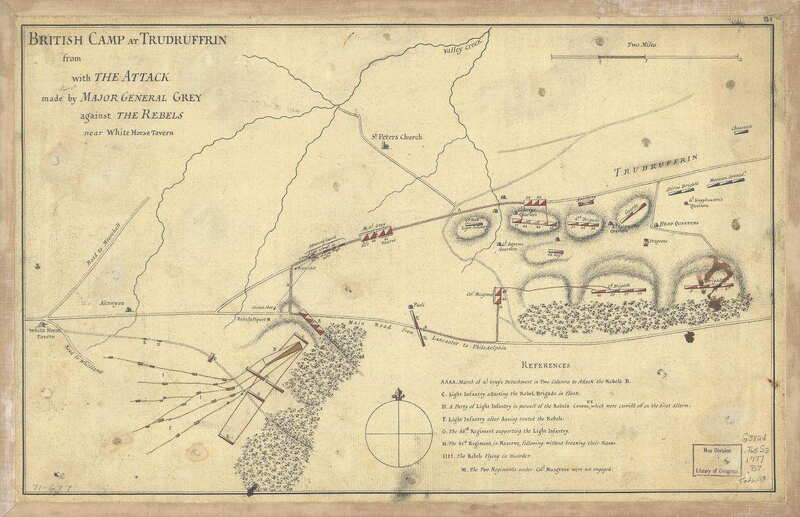 1777.19 A SKETCH OF THE BATTLE OF GERMAN. TN., 4th October 1777 where the Rebels were repulsed. 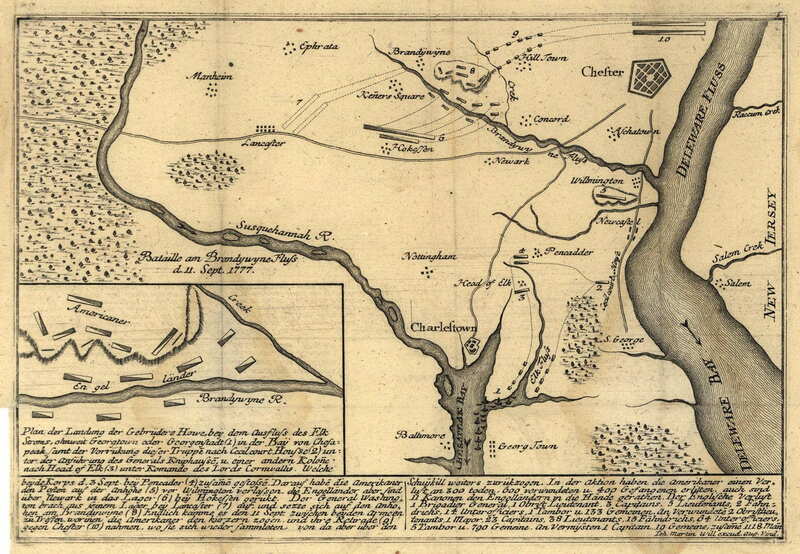 Two manuscript maps of similar title are in the Library of Congress on the Battle of Germantown. Sellers & van Ee #1344-45. One attributed to John Montresor is illustrated on page 57 of Marshall & Peckham and is shown here from Winsor (1884). See Docktor #277H5 also. Guthorn (#51-D7) lists a crude manuscript map showing the disposition of American forces and held at the Huntington Library. 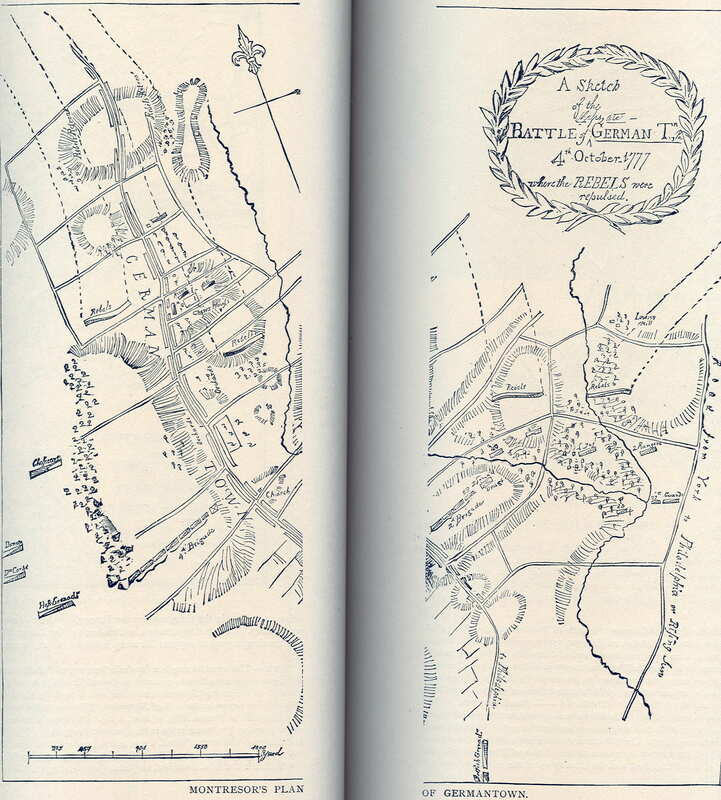 It is titled "Plan of Germantown Battle of Octob. 1775"; no explanation for the wrong date. 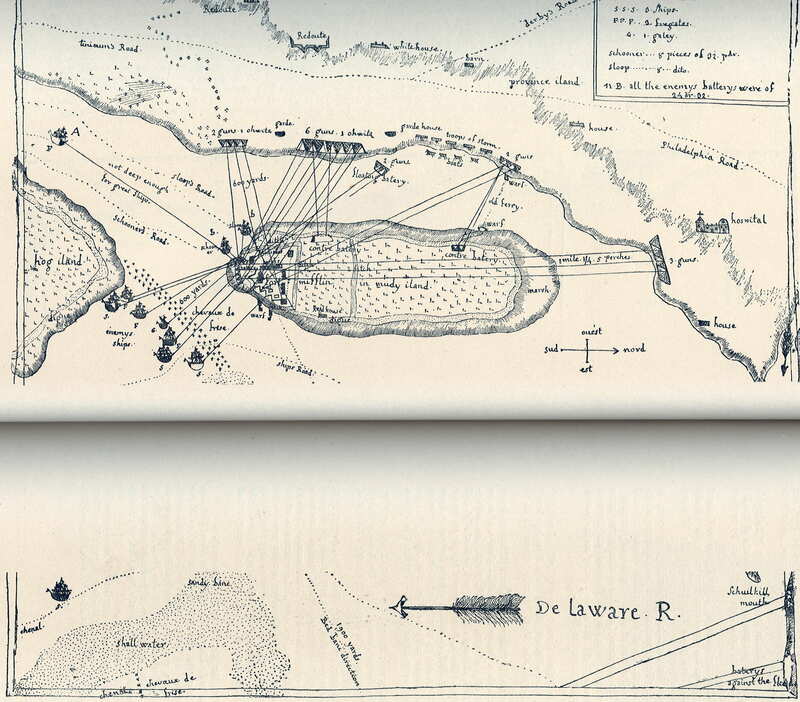 For a listing of other manuscript maps on the Germantown battle, see Guthorn (1972) #132. 1777.20 A PLAN OF THE ATTACKS AGAINST FORT MIFFLIN ON MUD ISLAND which surrendered 16th, November 1777 to the Kings troops... Drawn by T. Wheeler, ensn., 40th regt. This is a manuscript map in the Library of Congress, Sellers & van Ee #1347. There is another anonymous manuscript map titled PLAN OF FORT MIFFLIN ON MUD ISLAND also, Sellers & van Ee #1348; Docktor #278A3. 1777.21 (Pennsylvania and New York) The Library of Congress holds a set of 10 German maps and views circa 1777 attributed to Johann Martin Will with the catalog title Zehn Karten und Ansichten den Schlachtfelden des amerikanischen Unabhängigkeitskreiges in den Staaten Pennsylvanien und New York. 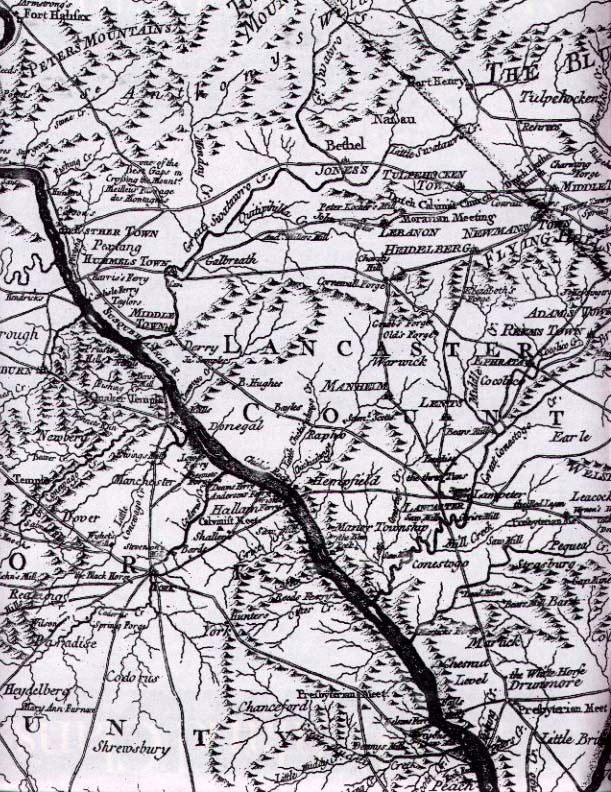 Included are maps of Brandywine : Bataille am Brandywyne Fluss d. 11 Sept. 1777, and Philadelphia : Grundriss von Philadelphia der Haupt-Stadt in Pensylvanien und umliegenden Gegend. This German map is based upon Scull & Heap's 1752 map and drawn to explain the war to a German audience. It shows the forts on the river islands and troop formations near Germantown; and is illustrated in M. P. Snyder, Figure 50, with a 1778 date. Some of these are probably related to the Hessian manuscript maps listed in Docktor #277R5, #277W6. 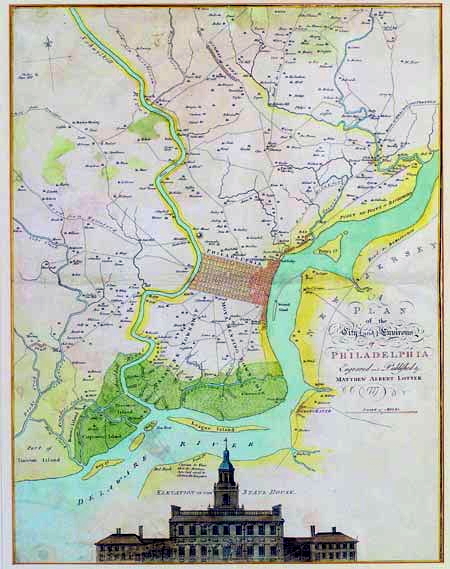 1777.22 A SURVEY OF THE CITY OF PHILADELPHIA & its environs comprehending the neck formed by the rivers of Delaware & Schuylkill; together with Province, Carpenter, and Mud Islands. & the several batteries & works constructed thereon. Philadelphia 15th. Decr. 1777. John Montresor Chief Engineer. This is a manuscript map showing exactly what the title says. It is reproduced in Hulbert(1907) which is the image here, though only the northern part including Philadelphia is shown. Phillips page 700, it is also illustrated in Guthorn (1972) page 35. See Docktor #27_M5 for a possibly related manuscript map in the Clements Library which is also listed in Guthorn (1972) #80-21. 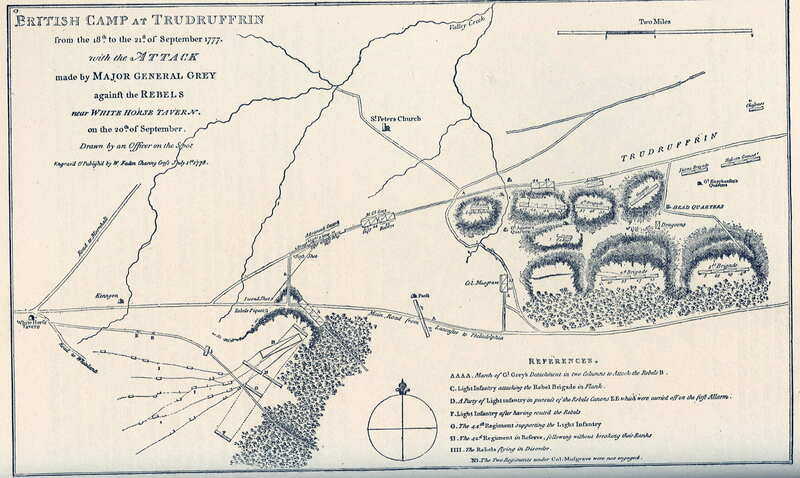 1777.23 PLAN OF THE OPERATIONS OF GENERAL WASHINGTON, AGAINST THE KINGS TROOPS IN NEW JERSEY. from the 26th. of December 1776 to the 3d. January 1777. by William Faden. London Publishd...15th. April 1777 by Wm. Faden. The map includes the Newtown - Middletown area of Bucks County and shows the road network in detail. Illustrated on page 93 of Nebenzahl & Higginbotham. This image is from the Library of Congress, which also has a manuscript version of this map. 1777.24 A PLAN OF THE CITY AND ENVIRONS OF PHILADELPHIA. Surveyed by N. Scull and G. Heap. Engraved by Willm. Faden 1777. London Publish'd... March 12th. 1777 by W. Faden. This is Faden's version of the Scull & Heap map 1752.1 and is illustrated on pages 116-7 of Nebenzahl & Higginbotham and on Figure 45 in M. P. Snyder. The image here is from the Library of Congress, Phillips page 700. 1777.25 PROGRESS OF THE BRITISH ARMY FROM THE LANDING IN ELK RIVER TO THE TAKING POSSESSION OF PHILADELPHIA ANNO 1777. 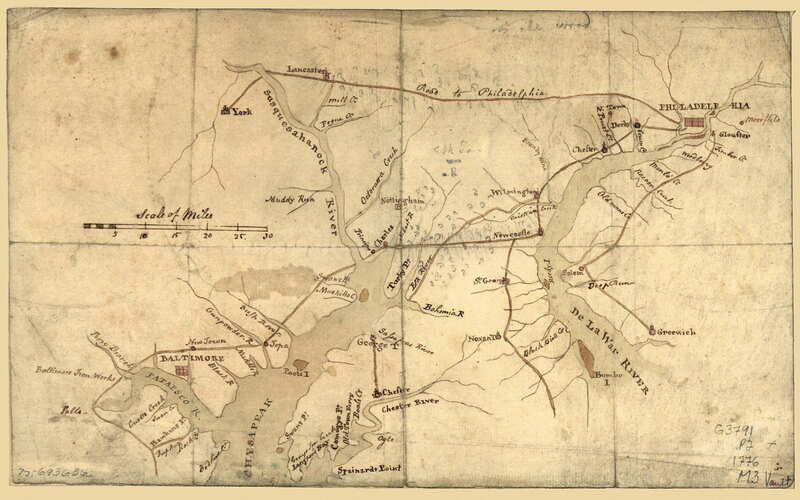 This manuscript map shows Howe's route of march north from the Chesapeake to surround the city. The road network is shown in detail. It is attributed to Capt. John Andre, the same British officer later executed in the Benedict Arnold affair. Illustrated on page 55 of Marshall & Peckham. This image is from the Library of Congress. There are two manuscript maps attributed to Andre concerning the Mud Island operations listed in Docktor #277A2, #277A2.0A. A military journal of Andre is at the Huntington Library. It contains several manuscript maps on Brandywine, Germantown, the Philadelphia fortifications, and the operations against Mud Island; see Guthorn (1972) #2. 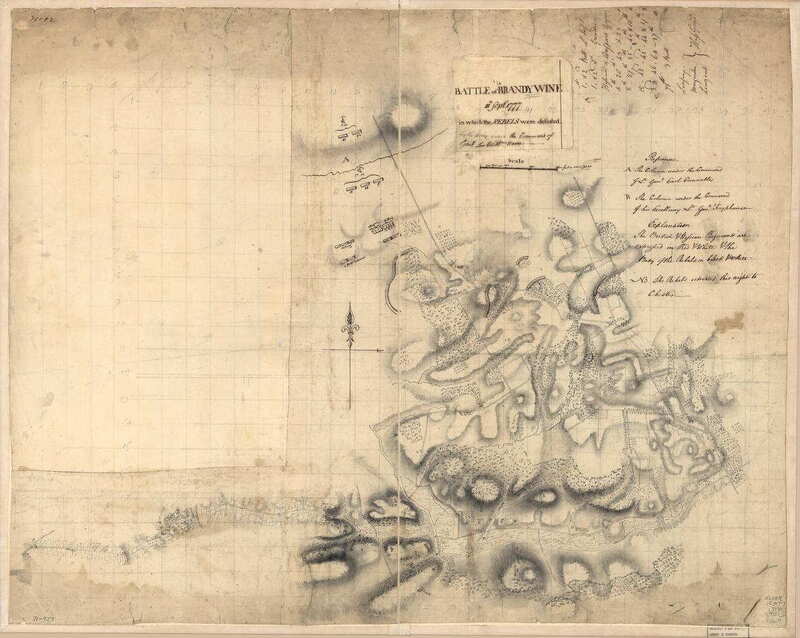 1777.26 PLAN OF THE GENERAL ATTACK ON FORT MIFFLIN..., a manuscript map of the mouth of the Schuylkill River with Hog, Mud, and Reedy Islands. The map shows the fort on Mud Island although that identification is wrong according to Marshall & Peckham, where this map is illustrated on pages 60-61. The fort was actually on Port Island. The map is attributed to Simon Fraser, a loyalist. This is possibly the map listed in Docktor #277A8. 1777.27 (Valley Forge) On page 63 in Marshall & Peckham is an anonymous, untitled and undated manuscript map of the encampment at Valley Forge during the winter of 1777-78, probably done by a British spy who actually visited the camp. It indicates Washington's headquarters and shows the encampment as three long rows of shacks or tents. Many historians have tried to portray this dismal time as a moral victory for Washington. The map was apparently found in the papers of General Henry Clinton and is now in the William Clements Library. 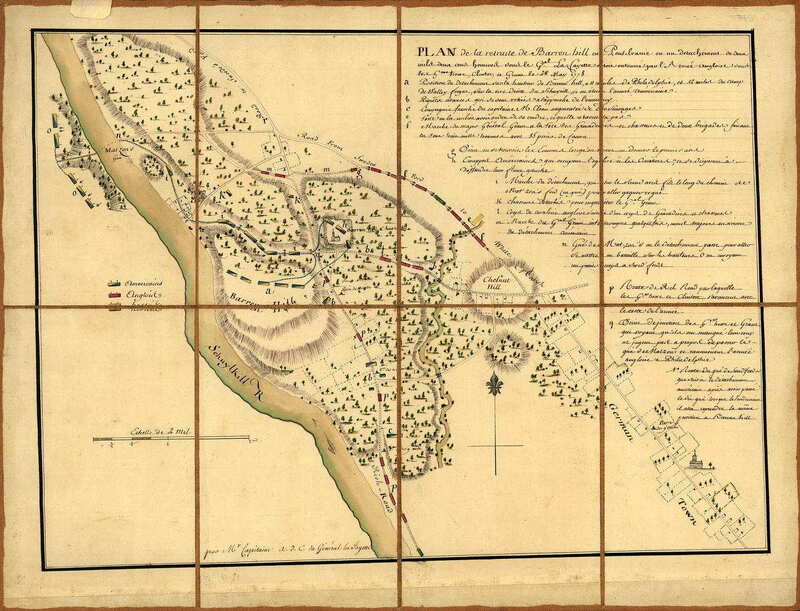 The Pennsylvania Archives, in Manuscript Group 11 #730, has a facsimile map "Contemporary Map of the Encampment at Valley Forge 1777-1778," by a French engineer, from the original in the Library of Hon. Samuel W. Pennypacker, LL.D., copyright by the Pennsylvania Society of the Sons of the Revolution, 1898. Roads, Flatland Ford, River, Bridge, encampments, old headquarters are shown. This appears to be a different contemporary manuscript map of Valley Forge. Docktor #278A9 lists a manuscript map of Valley Forge in the Jared Sparks papers at Cornell University Library dated 1778, and also one (#278A9.0C) in the Library of Congress. Guthorn (#51-D2) lists a color wash manuscript map 14 x 20 inches, and (#51 D 4) a 13 x 15 inch manuscript map dated to 1778; both of Valley Forge and held at the Historical Society of Pennsylvania. Winsor illustrates a composite map of Valley Forge shown here prepared from at least two sources. 1777.28 (Eastern Pennsylvania & New Jersey) An untitled manuscript map showing the road network between Philadelphia and Perth Amboy. It is attributed to John Montresor and probably prepared circa 1777-78. Illustrated on the front end paper in Marshall & Peckham. 1777.29 A NEW, ACCURATE & IMPROVED MAP OF BERKS COUNTY IN PENNSYLVANIA...Layd down from the most certain information and the best of authorities, during the severe campaign...anno...1776...and bearing No Allegiance to the Crown. Text in the left hand corner reads "True Turnpike Distances from Reading" and lists certain landmarks. The middle left corner reads "this Country was organized in the year 1752 from lands aquired in Indian Purchases June 7, 1684~Moungougsins Rles., Sept. 7, 1732~Sckuykill Indians, Oct. 25, 1736~the Five Nations, Aug. 22, 1749~The Nine Nations." Far left corner edge reads "Moft humbly compiled and executed by J.R. Rowe MCMLXXVII." This map was seen for sale as a reproduction and its authenticity has not been verified. 1777.30 (Philadelphia area) An untitled and undated manuscript map showing the operations of the British army in their march on Philadelphia. 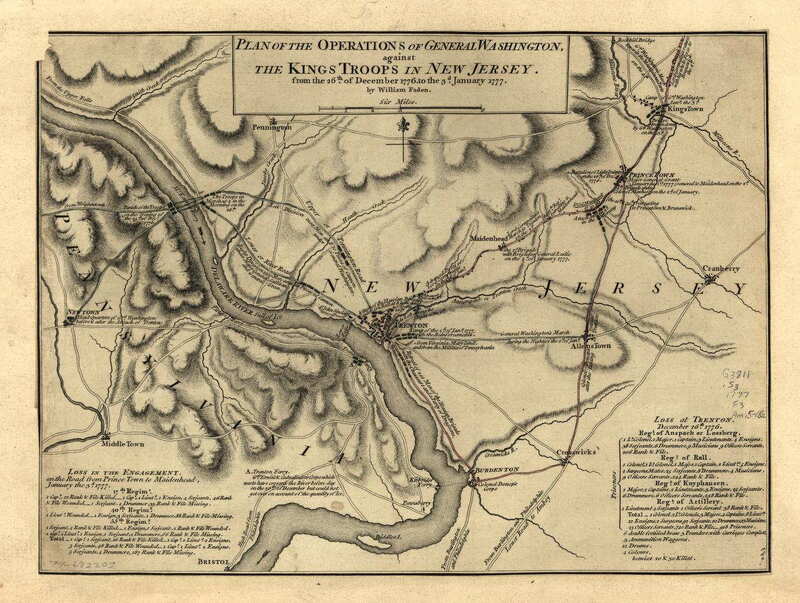 The Library of Congress, where this image is from, call the map "Operations of the British army, from the 25th August to 26th Sept. 1777," date it 1777? and attribute it to John Montresor. Phillips page 699, listed in Docktor #277M3, Guthorn (1972) #132-2. 1777.31 THIS IS NOT GIVEN AS AN ACCURATE MAP, but only to afford an idea of the progress of the army from the landing at Elk to the taking of possession of Philadelphia. The brown lines are the supposed marches of the rebels. This manuscript map with the notation title is in the Library of Congress where it is dated 1777, the date of the operations described. It was apparently in the papers of the British General Grey. See Guthorn (1972) #132-1-3. 1777.32 A NEW AND ACCURATE MAP OF THE PRESENT SEAT OF WAR IN NORTH AMERICA, COMPREHENDING NEW JERSEY, PHILADELPHIA, PENNSYLVANIA, NEW-YORK &C. This map is from the Universal Magazine of June 1777. Only the eastern most parts of Pennsylvania are included from just west of Philadelphia. The road network is shown and the various New York - New Jersey boundaries considered are illustrated along with the old East and West Jersey line. The edge coloring on this copy is not original. Scale: 1 inch = 8 miles. Size: 14 x 11 inches. 1777.33 (Philadelphia, Mud Island) Mud island lay in the Delaware River near Philadelphia and was the site of Fort Mifflin, one of the city's defenses against British attack. According to Winsor (1884), there are several manuscript maps in the Jared Sparks papers at Cornell University done by a French Major Fleury which show the island and the British advance. A facsimile of one appearing in Winsor is shown here along with a more detailed view of the fort . Also, see Docktor #277F6, #277F6.0A-0D, #278F5; and Guthorn #18. 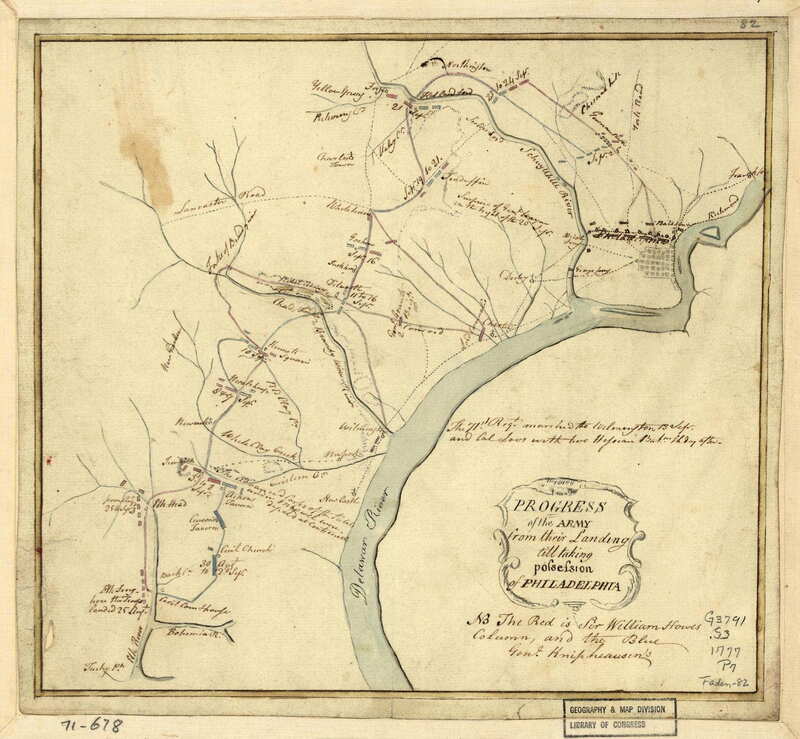 Guthorn (#51-D3) lists a manuscript map held by the Historical Society of Pennsylvania labeled "Esquisse des forts sur le delaware, Forts Mercer & Mifflin", and which he titles "Plan of the Attack on Mud Island in the Delaware Novr 1777." 1777.34 PLAN OF THE ENGLISH LINES NEAR PHILADELPHIA 1777, by Lewis Nicola. 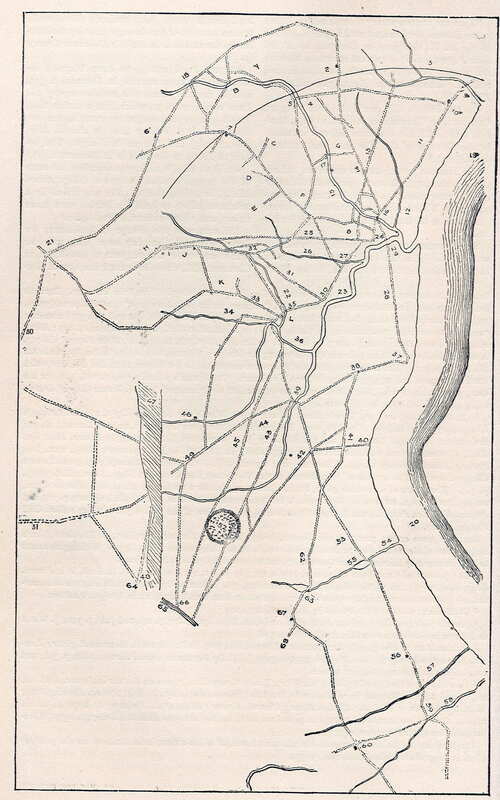 A manuscript map depicting the line of redoubts built by the British around the city after taking Philadelphia. There are a couple insets showing details of redoubt construction. Original at the Historical Society of Pennsylvania, illustrated in M. P. Snyder, Figure 51. The image here is from Winsor. This is likely the map listed in Docktor #277A8.0A, also see Docktor #278A8, Guthorn #31. 1777.35 THE TAKING OF MISS MUD ILAND, sold by W. Humphrey 227 Strand London. Although this has attributes of a crude map, showing ostensibly the fort on Mud Island firing on some ships, it is really a rather risque political cartoon. Illustrated by M. P. Snyder, Figure 54. 1777.36 BROUILLON OU PLAN DU CAMP DE VALLIE FORGE, by Louis LeBeque de Presle Duportail. A pen and ink manuscript map of the Valley Forge area rather hard to decipher. The original is at the Historical Society of Pennsylvania, illustrated in M. P. Snyder, Figure 191. Guthorn (#15) says this may be the initial plan of Valley Forge. Docktor #278D1, #278D7, #278D7.01 - 02. 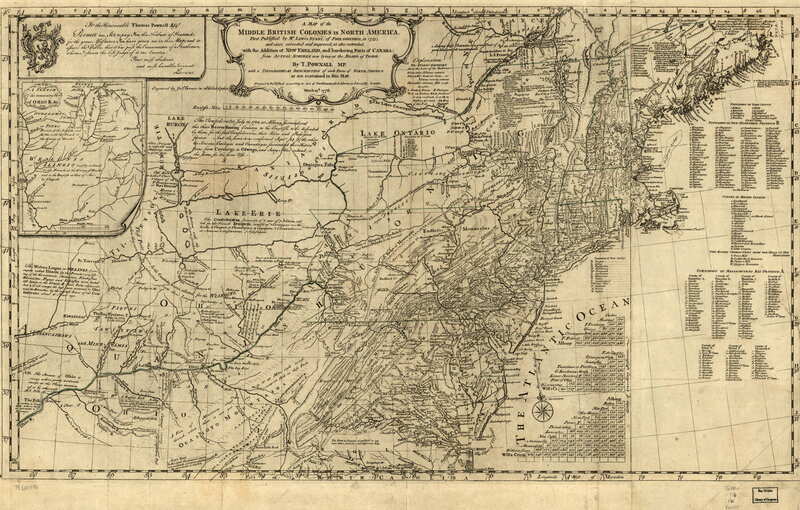 1777.37 AN ACCURATE PLAN OF THE COUNTRY BETWEEN NEW YORK AND PHILADELPHIA; with the Dispositions of the Forces: Extracted from the Gazette of Tuesday, Febr. 25th 1777, by Stephen Pyle. An illustration of troop movements between the two cities, Docktor #277P4, #277P5. 1777.38 PLAN OF THE BATTLE OF BRANDYWINE, a manuscript map in the Royal Library, Winsor Castle, attributed to Robertson "Captain of Engineers." In the same collection is a second manuscript map attributed to Robertson titled SKETCH OF THE ATTACK AT GERMAN TOWN 4TH OCT. 1777. Docktor #277R8, #277R8.0A. Archibald Robertson was a British engineering officer who also prepared a watercolor panoramic view of Philadelphia illustrated in M. P. Snyder, Figure 58. 1777.39 (Brandywine) The Historical Society of Pennsylvania has an untitled manuscript map believed to be Washington's map of the Brandwine area and a facsimile in Winsor is shown here. The map is inscribed "Laid down at 200 ps. in an Inch, the 27th day of August, An. Domi 1777, pr Jacob Broom, survr, N. Castle." There is a table of distances and an accompanying legend said to be in Washington's handwriting and given in Winsor. See also Guthorn #9 and Guthorn (1972) #132 for Brandywine manuscript maps. 1777.40 (Philadelphia) Guthorn (#51-D5, 6) lists two manuscript maps held at the Historical Society of Pennsylvania. One titled "Roads about Skippack, Germantown &c. taken October 1777; and the other just "Roads round Philadelphia." The first shows troop positions, camps, and movements; the second is a crude road map. 1777.41 A MAP OF THE SEAT OF WAR IN THE PROVINCE OF YORK, JERSEY AND PENNSYLVANIA; WITH THE INTERIOR COUNTRY AS FAR AS ALBANY. From the best Authorities. London Printed according to the Act of Parliament for J. Almon, in Piccadilly, March 1st., 1777. This small (4 x 6.5 inches) map appeared in the obscure English magazine The Remembrancer or, Impartial Repository of Public Events. Guthorn (1972) #154-4. 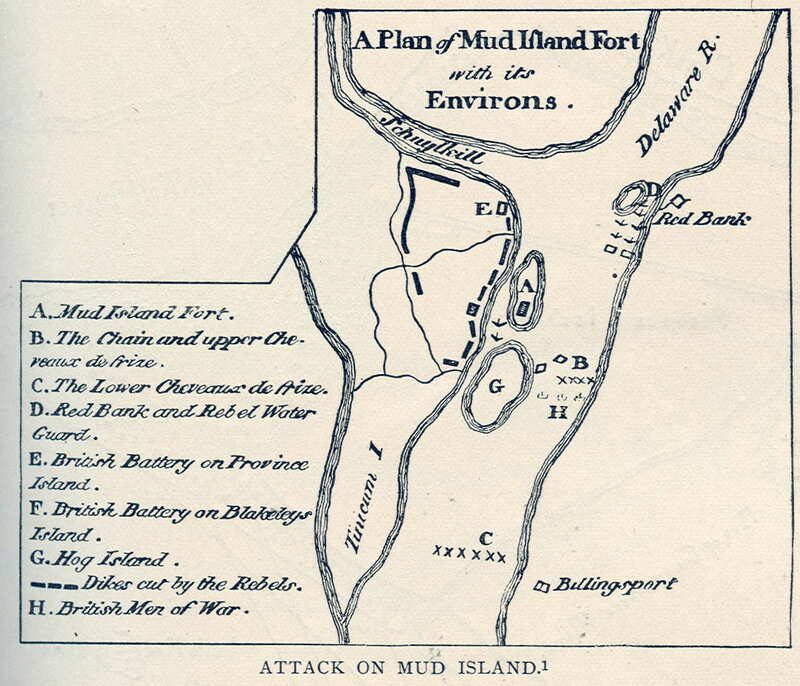 1777.42 A PLAN OF MUD ISLAND AND FORT MIFFLIN WITH THE SIEGE THEREOF AND ITS EVACUATIONS THE 15TH. OF NOVEMBER 1777..., a manuscript map attributed to Charles Blaskowitz, a colonial surveyor; see Guthorn (1972) #11-14. 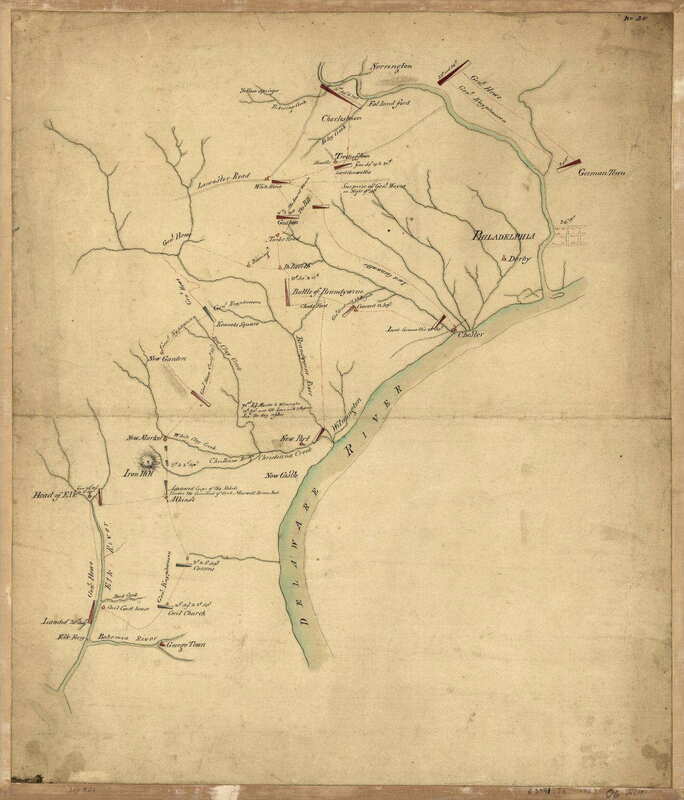 1777.43 (Southeast Pennsylvania) A manuscript map showing the Delaware, Susquehanna, and the road network of the southeast is in the diary of Andrew Snape Hamond, a British naval officer involved in the landings of Howe's troops at Elk River and subsequent operations on the Delaware. The diary is held by the University of Virginia Library; see Guthorn (1972) #52. There are a couple similar anonymous and undated manuscript maps in the Clements Library, see Guthorn (1972) #132-7,8. 1777.44 (Delaware River) An untitled and undated manuscript map circa 1777 attributed to Montresor showing the Bristol - Burlington area of the Delaware just north of Philadelphia. Guthorn (1972) #80-20. 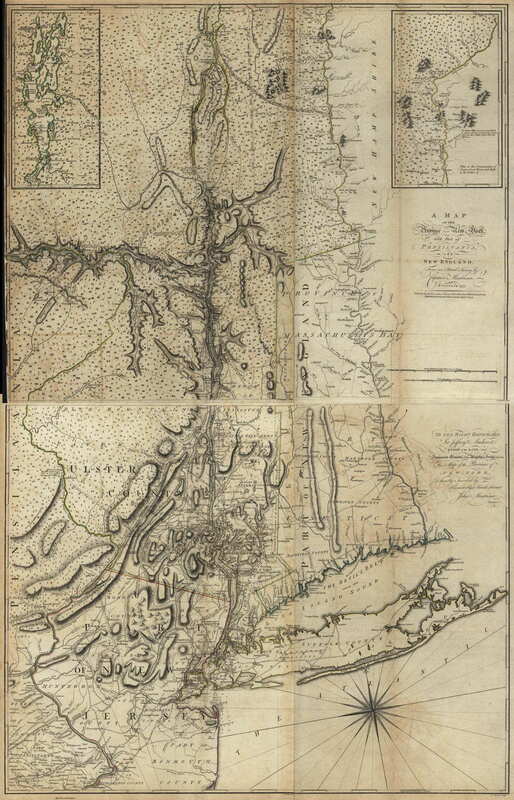 1777.45 MAP OF HUDSON'S RIVER WITH THE ADJACENT COUNTRY. This is a map from Scot's Magazine published in 1777. The same map was in the Gentleman's Magazine of January, 1778. It includes a large chunk of eastern Pennsylvania shown as extending to the 43rd parallel. The main focus of the map is the river, coverage extends from Crown Point south to Philadelphia and west as far as Lancaster. Phillips page 323. 1778.1 LA PENSILVANIE EN TROIS FEUILLES. TRADUITE DES MEILLEURES CARTES ANGLAISES. A MAP OF PENNSYLVANIA EXHIBITING NOT ONLY THE IMPROVED PARTS OF THAT PROVINCE BUT ALSO ITS EXTENSIVE FRONTIERS... Paris chez La Rouge. This version of William Scull's 1770 map was published by Georges Louis le Rouge in Atlas Ameriquain Septentrional, Paris 1778, and is the French version of the map from Thomas Jeffreys' The American Atlas published by R. Sayer & J. Bennett in 1776. The image here is from a modern black line reproduction. The map is large (26 x 52 inches) and only the regions around Pittsburgh and Lancaster are shown here. 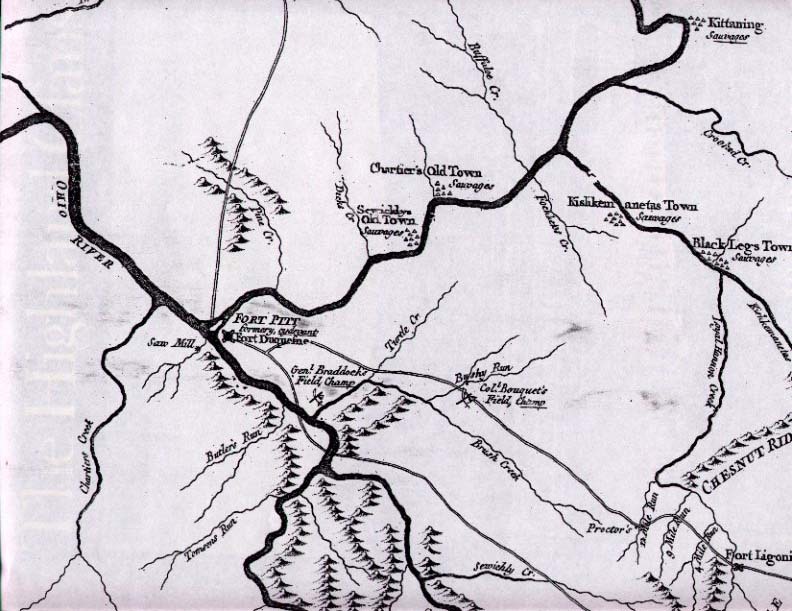 William used information about western Pennsylvania gained during the French and Indian War to update his grandfather Nicholas Scull's 1759 map. Thus, the locations of Braddock's defeat and Bouquet's victory are shown near Pittsburgh, but not much else. By contrast, the region around Lancaster and York is filled with the names of towns and other features. Blank verso. Scale: 1 inch = 6 miles. Sellers & van Ee #1297, Phillips page 675. 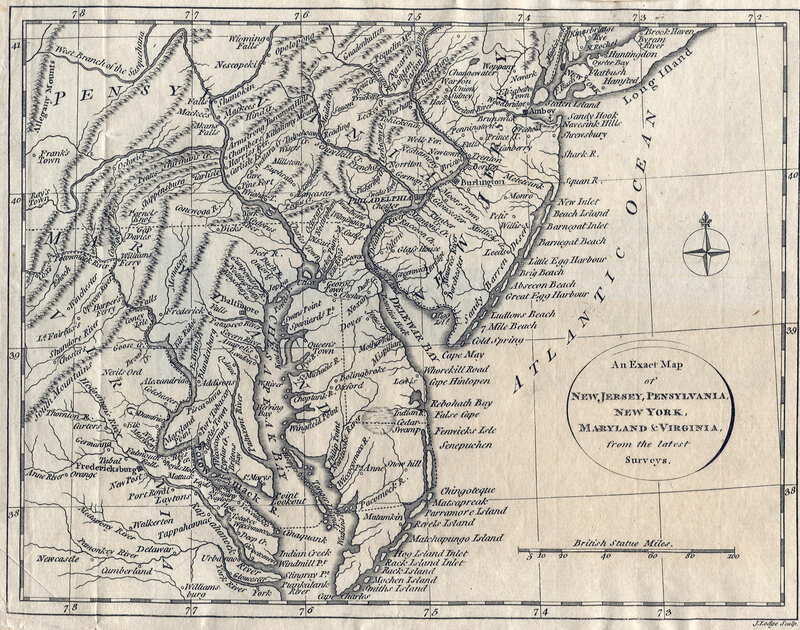 1778.2 AN EXACT MAP OF NEW JERSEY, PENNSYLVANIA, NEW YORK, MARYLAND & VIRGINIA FROM THE LATEST SURVEYS, J. Lodge, Sculp. This map is from The History of America by William Russell, published by Fielding & Walker, London 1778. It covers an area from New York City south to include all the Chesapeake Bay and west to the Allegheny Mountains including southeastern Pennsylvania, all of New Jersey and Delaware, eastern Maryland and Virginia. A large number of towns are located and named, mountains and shorelines are shown in shaded relief. Delaware is not named in the title nor on the map, though its boundaries are shown. See Phillips pages 590, 859. Longitude is west from London. Blank verso. Scale: 1 inch = 38 miles. Size: 8 x 10 inches. 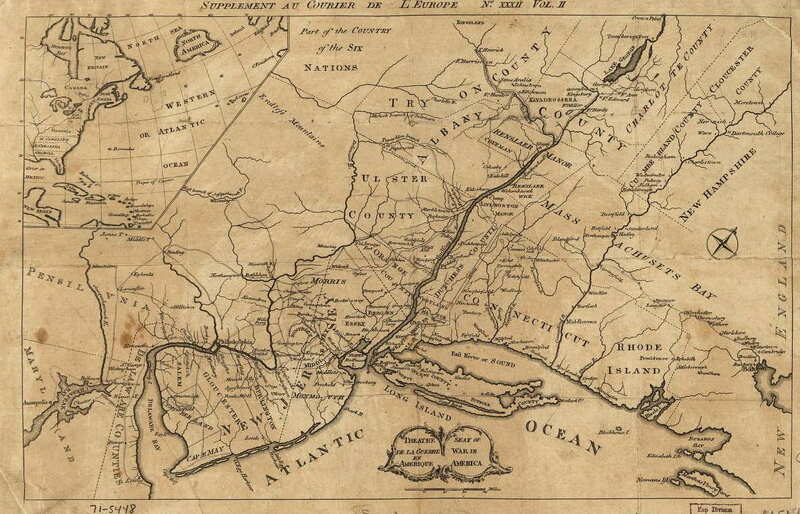 1778.3 AN EXACT MAP OF NEW ENGLAND, NEW YORK, PENSYLVANIA & NEW JERSEY, FROM THE LATEST SURVEYS. J. Lodge sculp. This is a companion map from the same book as the one above. Northeastern Pennsylvania is included and shown extending north to 42d 45m. McCorkle #778.5. Longitude is west from London. Blank verso. Scale: 1 inch = 38 miles. Size: 8 x 10 inches. 1778.4 PARTIE SEPTENTRIONALE DES POSSESSIONS ANGLOISE EN AMERIQUE, pour servire d'intelligence a la guerre presente entre les Anglois et leur colonies dressee sur les meilleurs cartes du pays traduite de l'Anglois, de Michel a Paris a l'Hotel de Soubise 1778. A French map attributed to Brion de la Tour. It includes northeastern Pennsylvania. There is a companion map, PARTE MERIDIONALE..., of the coast down to Carolina which includes a strip of southeastern Pennsylvania. These maps were seen at auction attributed to the French engravers Ambrose Verrier and Francoise Perrier. McCorkle #778.2; Sellers & van Ee #161. 1778.5 CARTE DU THEATRE DE LA GUERRE ACTUEL entre les Anglais et les Treize Colonies Unies de l'Amerique Septentrionale dressee par J. B. Eliot ingenieurs des Etats Unis 1778. A Paris chez Mondhare Rue St. Jacques a la Ville de Caen. 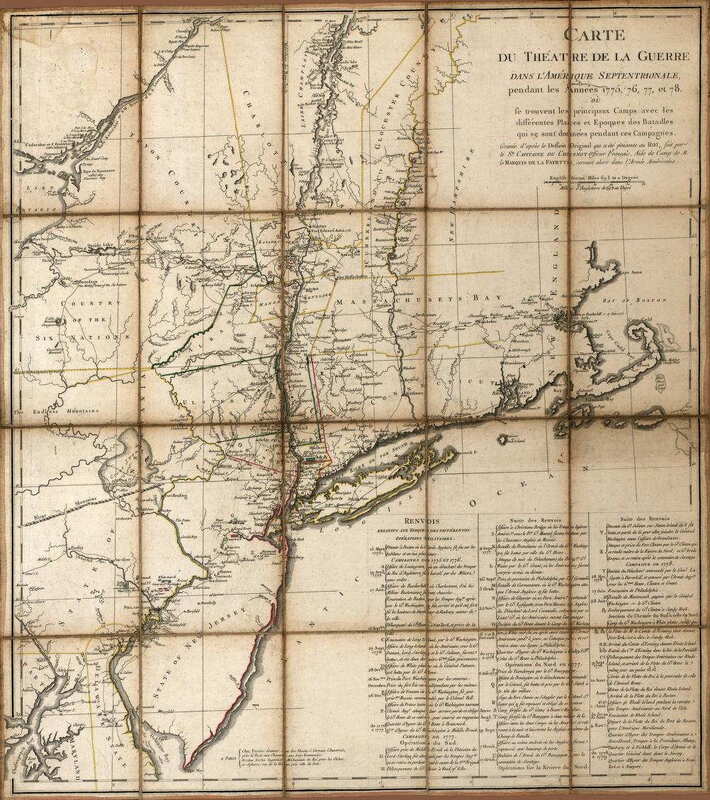 This French map is often considered the first to name the United States (Etats Unis); however the name does not appear in the title (which has Treize Colonies) and the map shows only part of the northeast centered on New York. Map 1778.10 would appear to have a better claim since Etats Unis appears in the title and the map shows a wider region, but still not the entire United States. This map includes only eastern Pennsylvania with counties, rivers, and some towns named. This image is from the Library of Congress. McCorkle #778.3, 781.6; Sellers & van Ee #734-36. 1778.7 LE COLONIE UNITE DELL: AMERICA SETTENTRLE. di nuova projezione a SS. EE. li Signori riformatori dello studio di Padova Venezia 1778 Presso Antonio Zatta con privilegio dell' eccellentissimo Senato. This map is from Antonio Zatta's Storia Dell'America Settentrionale 1778, and is a copy of John Mitchell's 1755 map. Slightly later Zatta published Atlante Novissimo, Venice 1778, a ten sheet edition of John Mitchell's map, where LE COLONIE... is the title sheet and an east coast map is titled IL CANADA... . Sheet (Fogl) V is titled LA PENSILVANIA, LA NUOVA YORK, IL JERSEY SETTENTRIOLE, CON LA PARTE OCCIDENTALE DEL CONNECTICUT, MASSACHUSETTS-BAY E L'IROCHESIA and is shown here. Pennsylvania extends to the 43rd parallel with its western boundary a mirror image of the eastern. The eastern counties, rivers, and some towns are named as well as many Indian villages. This map is illustrated in McCorkle #778.11 along with several of the other sheets, also in Portinaro & Knirsch. 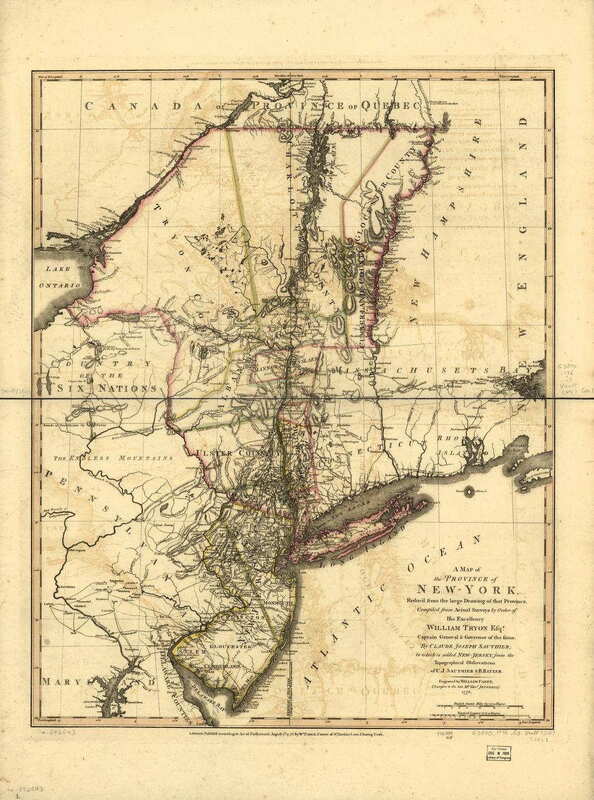 "Colonie Unite dell America" has been credited by some as the first map to both show and name the entire new United States. 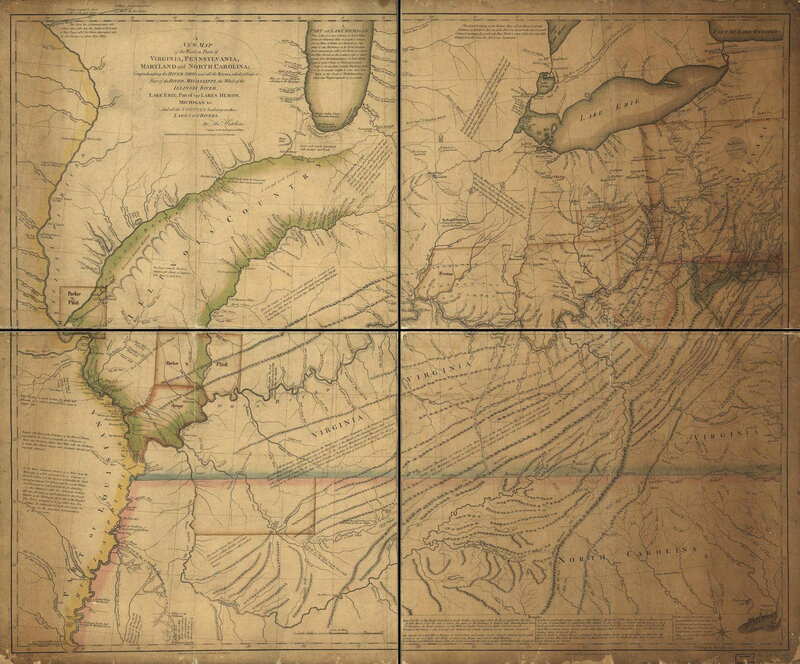 Another sheet showing Virginia to Carolina includes a strip of southern Pennsylvania. Sellers & van Ee #163-64. Longitude east with Philadelphia at about 302d 30m, blank verso. Scale: 1 inch = 33 miles. Size: 12 x 16.5 inches. 1778.8 ALLGEMEINE CHARTE VON NORD AMERIKA ALS DEN SITZ DES KRIEGES ZWISCHEN DEN KONIGL. ENGL. TRUPPEN U: DEN PROVINZIALEN. Nach der in London mit Konigl. privilegio, nach der Parlements acte von 7. Jan. 1776, zu haben in Hamburg in der Mollerische Buchhandlung, 1778. T. A. Pingeling sculp Hamb: This map is a German copy of map 1776.3 with English place names. It also appeared as a broadsheet above three columns of text. McCorkle (#778.13) compares several versions; also Sellers & van Ee #142. 1778.10 CARTE DU CANADA ET DES ETATS-UNIS DE L'AMERIQUE SEPTENTRIONALE par le Sr. Robert de Vaugondy.... A Paris chez Fortin... 1778 (McCorkle #778.16). This is an updated version of map 1753.2 and one of the first maps to name the United States (Etats-Unis) in the title. McCorkle shows both versions. 1778.11 A CHOROGRAPHICAL MAP OF THE NORTHERN DEPARTMENT OF NORTH AMERICA drawn from the latest and most accurate observations. This peculiar map with southeast at the top is attributed to Bernard Romans. Pennsylvania just barely makes it onto the right edge. There was also a 1780 Amsterdam version, both illustrated by McCorkle #778.17, 780.14. 1778.13 MAPPA GEOGRAPHICA PROVINCIAE NOVAE EBORACI AB ANGLIS NEW YORK dictae ... Claudii Josephi Sauthier cui accedit Nova Jersey... Homannianor. Heredum 1778. This is the Homann Heirs version of map 1776.14 and published in Atlas Geographicus Maior, Norimbergae: Homann Erben, 1778. McCorkle #778.19; Sellers & van Ee #1049. Image from the Heritage Map Museum by permission. 1778.14 A NEW MAP OF THE WESTERN PARTS OF VIRGINIA, PENNSYLVANIA, MARYLAND AND NORTH CAROLINA; comprehending the river Ohio, and all the rivers, which fall into it; part of the River Mississippi, the whole of the Illinois River, Lake Erie; part of the Lakes Huron, Michigan &c. And all the country bordering on these lakes and rivers. By Thos. Hutchins, Captain in the 60 Regiment of Foot. London Published according to Act of Parliament...1778 by T. Hutchins. Engraved by T. Cheevers. This map was made to accompany A topographical description of Virginia, Pennsylvania, Maryland, and North Carolina..., published by Hutchins in 1778 and is probably his best known map. It includes western Pennsylvania as far east as the Allegheny Front. The map is illustrated in Brown #51, Stephenson & McKee, listed in Phillips page 677. This image is from the Library of Congress. A map titled A TABLE OF DISTANCES BETWEEN FORT PITT, AND THE MOUTH OF THE RIVER OHIO is also in A topographical description..., see Docktor #278H2. For a biography of Hutchins, see Quattrocchi in the References. 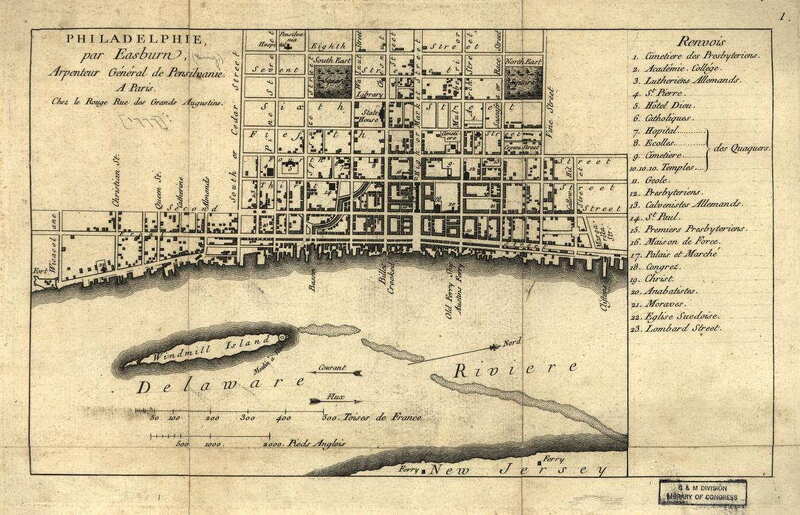 1778.15 A PLAN OF THE CITY OF PHILADELPHIA. This map by John Norman appeared in The Philadelphia Almanack for the Year 1778. Sellers & van Ee #1316, Wheat & Brun #459, illustrated in M. P. Snyder, Figure 62. 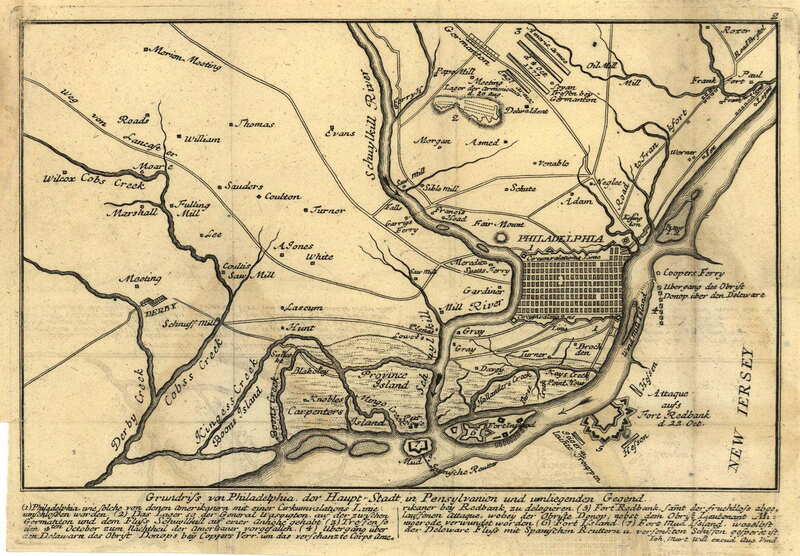 1778.16 ENVIRONS DE PHILADELPHIE. par Scull et Heap, Publie & Londres par Faden en 1777. Traduit d l'Anglais. A Paris, chez le Rouge Ingr. Geographe du Roi, 1778. Another Scull & Heap copy, this map appeared in Le Rouge's Pilote americain septentrionale. Sellers & van Ee #1318, illustrated in M. P. Snyder, Figure 47. 1778.17 PLAN OF THE CITY OF PHILADELPHIA AND ITS ENVIRONS shewing its defenses during the years 1777 & 1778, together with the siege of Mud Island on the River Delaware. This is another manuscript map signed by John Montresor and prepared by Nicole similar to map 1777.13. Sellers & van Ee #1324, Docktor #278N1. 1778.18 BATTLE OF BRANDYWINE in which the rebels were defeated, September the 11th. 1777, by the army under the command of General Sr. Willm. Howe. Engraved by Wm. Faden, 1778. This battlefield map exists in two quite different versions, see Sellers & van Ee #1337-38. It is based on map 1777.17. One version is illustrated on page 112 of Nebenzahl & Higginbotham. 1778.19 BRITISH CAMP AT TRUDRUFFRIN FROM THE 18TH. TO THE 21ST. OF SEPTEMBER 1777, with the attack made by Major General Grey against the rebels near White Horse Tavern on the 20th. of September. Drawn by an officer on the spot. W. Faden, 1778. The Library of Congress has a manuscript draft of this map which is shown here, see Sellers & van Ee #1341-42. The printed map appeared in Faden's Atlas of Battles of the American Revolution, and is illustrated on page 115 of Nebenzahl & Higginbotham, and in Figure 190 in M. P. Snyder. It also appears in Winsor, shown here . Docktor #277A6.0A is a related anonymous manuscript map in the New York Public Library. 1778.20 PLAN OF GENL DU PORTAIL. 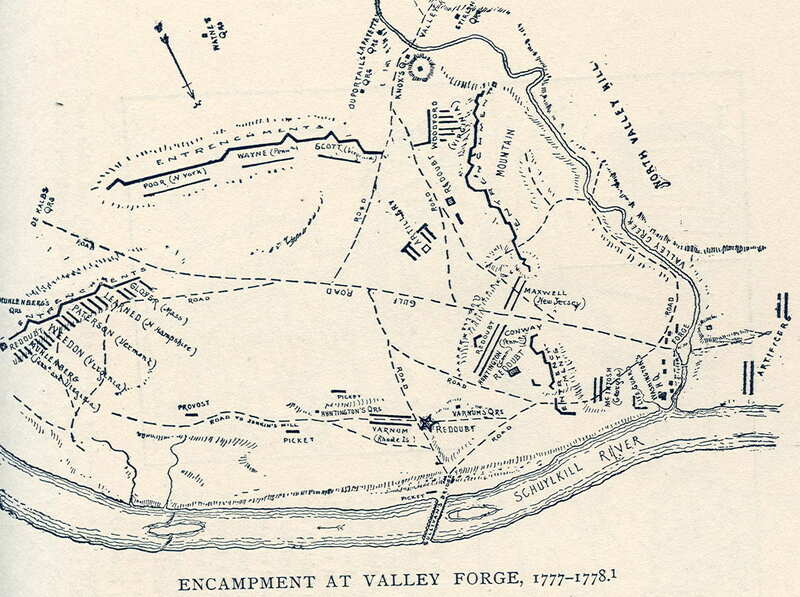 PLAN OF THE POSITION OF VALLEY FORGE AFTER JANY. 1778. A manuscript map attributed to Louis Duportail, Sellers & van Ee #1349, Guthorn #15. This is possibly another version of map #1777.36. 1778.21 THE COURSE OF DELAWARE RIVER FROM PHILADELPHIA TO CHESTER, exhibiting the several works erected by the rebels to defend its passage, with the attacks made upon them by His Majesty's land & sea forces. 1778. This is a map by William Faden in Atlas of Battles of the American Revolution. The Library of Congress also has a manuscript draft, Sellers & van Ee #1361-62, and there are other contemporary manuscript maps, see M. P. Snyder, Guthorn (1972) #63-2. 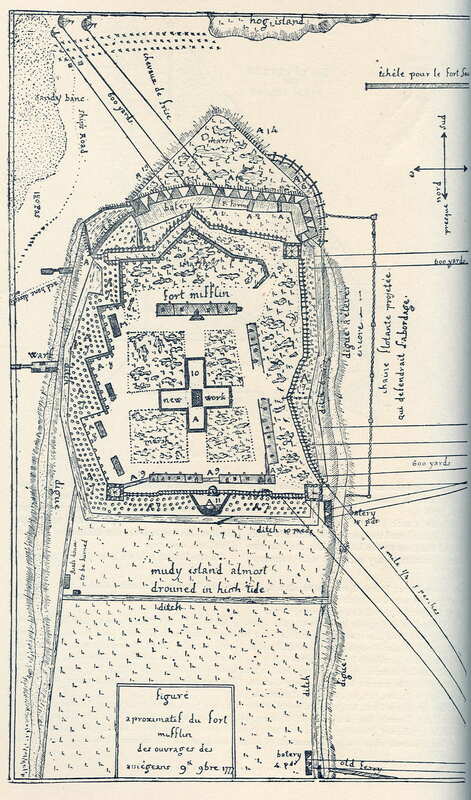 There is an inset titled A Sketch of Fort Island; a later version by Faden (1779) changed this to A Plan of Fort Mifflin on Mud Island. Illustrated by M. P. Snyder, Figure 55. See also Docktor #285F1, #285F2, #285F7; Guthorn (1972) #132. 1778.22 PLAN DE LA RETRAITE DE BARREN HILL EN PENSILVANIE: ou un détachement de deux mille deux cent hommes sous le G'al LaFayette étois entouré par l'Armée angloise sous les G'als Howe, Clinton et Grant le 28 May 1778 / par M'r Capitaine, A.d.C. du Général LaFayette. This manuscript map from the Library of Congress by Michel Capitaine du Chesnoy covers Barren Hill and vicinity (i.e. Montgomery County) with Chestnut Hill and Germantown. Place-names are in English. This was part of Howe's campaign to capture Philadelphia. Illustrated in M. P. Snyder, Figure 192; and in Guthorn, page 10, who also lists 5 extant manuscript versions of varying size and title. Also see Docktor #278A5.0A - 0E. 1778.23 (Northcentral Pennsylvania) This is an untitled and anonymous manuscript map, dated circa 1778, of the Sunbury area and western New York showing the east and west branches of the Susquehanna River. It is held at the Library of Congress where this image comes from. The LOC title for it is PLAN OF PART OF WESTERN FRONT. This is probably the map listed in Phillips page 677 dated 1779?, and in Docktor #278A1. 1778.24 PLAN DER GEGEND UND STADT VON PHILADELPHIA, a German version of Scull & Heap's map appearing in Geschichte der kriege in und ausser Europa, Nurnberg, G. N. Raspe 1778. Phillips page 701, also illustrated on Figure 48 in M. P. Snyder. Figure 43 in Snyder is a small and plain map of the Philadelphia street grid titled GRUNDRISS DER STADT PHILADELPHIA from Raspe, whose "rarity exceeds its importance." 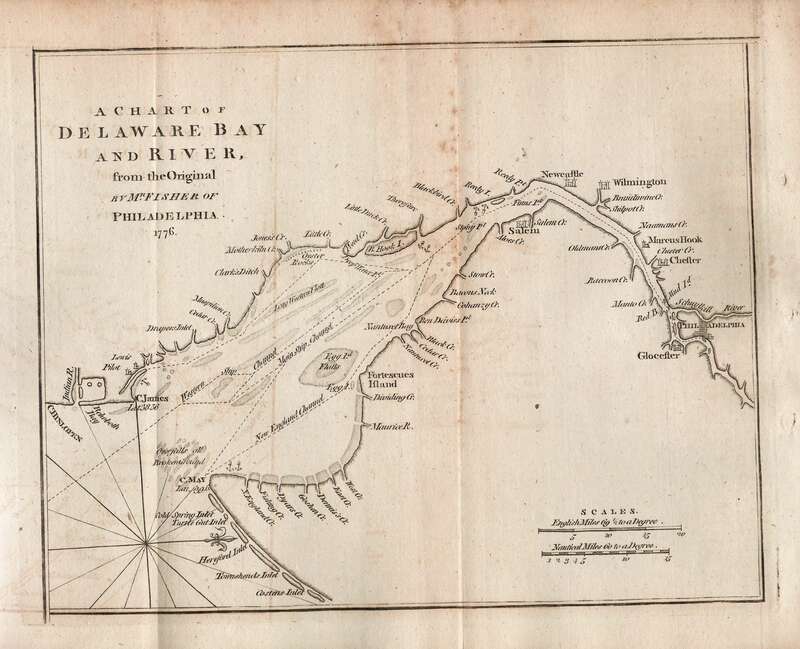 1778.25 TO THE AMERICAN PHILOSOPHICAL SOCIETY THIS MAP OF THE PENINSULA BETWEEN DELAWARE & CHESOPEAK BAYS, with the said bays and shores adjacent drawn from the most accurate surveys is inscribed by John Churchman. The dating of this map is uncertain and the Library of Congress, the source of this image, date it circa 1778. This map is part of the LOC collection belonging to the French general Rochambeau, commander of the French army in America during the Revolution. Only the southeastern tip of Pennsylvania is included. 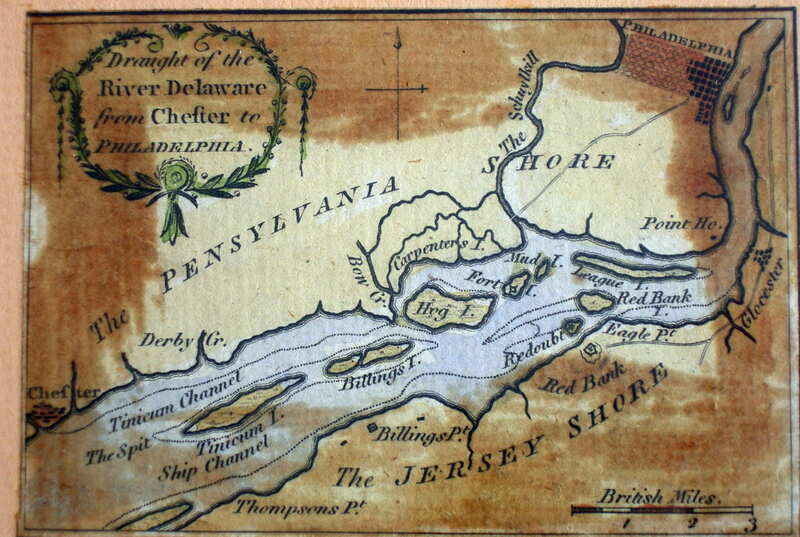 1778.26 PLAN OF PART OF THE RIVER DELAWARE FROM CHESTER TO PHILADELPHIA, in which is mark'd the position of His Majs. ships on the 15th. of November 1777. The obstructions to the navigation of the river, laid down by the rebels, are also mark'd. This is a manuscript map by John Hunter in the Library of Congress dated 1778. It is very decorative and Hunter must have been an aspiring artist; actually he was a British naval officer with a long career through the Napoleonic wars winding up a vice admiral. Sellers & van Ee #1366. Docktor #278H1, Guthorn (1972) #63-2. 1778.27 A CHOROGRAPHICAL MAP, OF THE COUNTRY, ROUND PHILADELPHIA. By B-Romans. The map is dated from ads which appeared for it in newspapers of the time. Valley Forge is shown and called "Grand American Winter Camp January 1778." 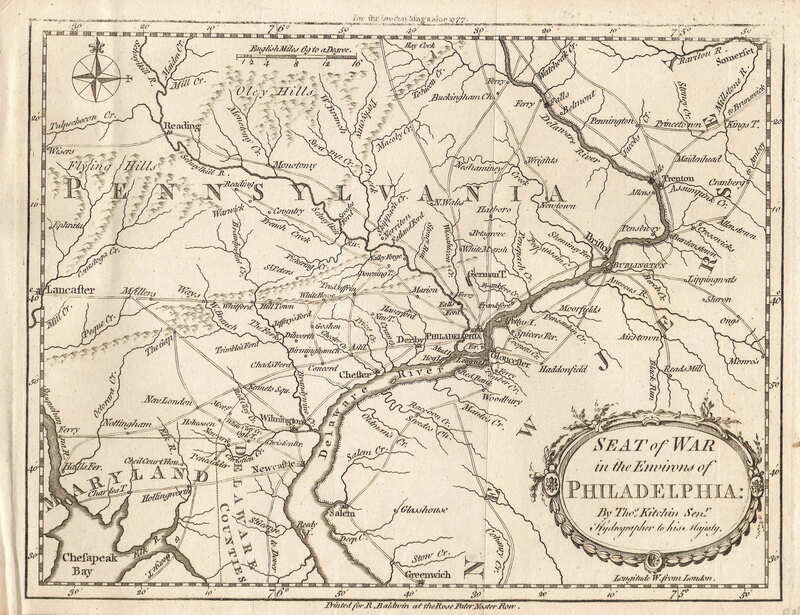 The map was republished circa 1780 with the added title CARTE PARTICULIERE DES ENVIRONS DE PHILADELPHIE. K. Klockhoff sculps. A Amsterdam, chez Covens et Mortier, et Covens, junior. This image of the Klockhoff print comes from the Library of Congress. Wheat & Brun #304, Phillips page 701, Guthorn #41-7,8. 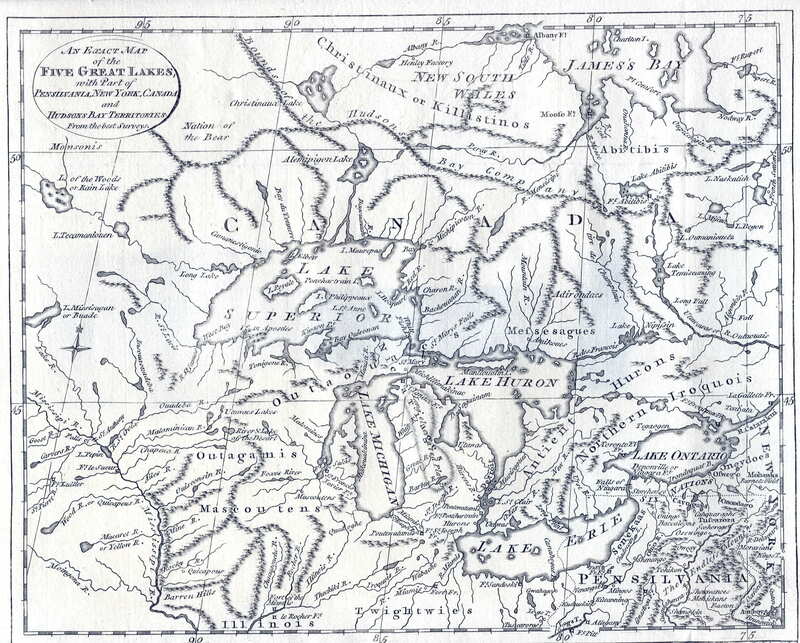 1778.28 AN EXACT MAP OF THE FIVE GREAT LAKES WITH PART OF PENSILVANIA, NEW YORK, CANADA AND HUDSONS BAY TERRITORIES FROM THE BEST SURVEYS, J. Lodge, Sculp. This map includes northern Pennsylvania south to 40d and is a companion to maps 1778.2, 3 above, all from The History of America by William Russell, published by Fielding & Walker, London 1778. 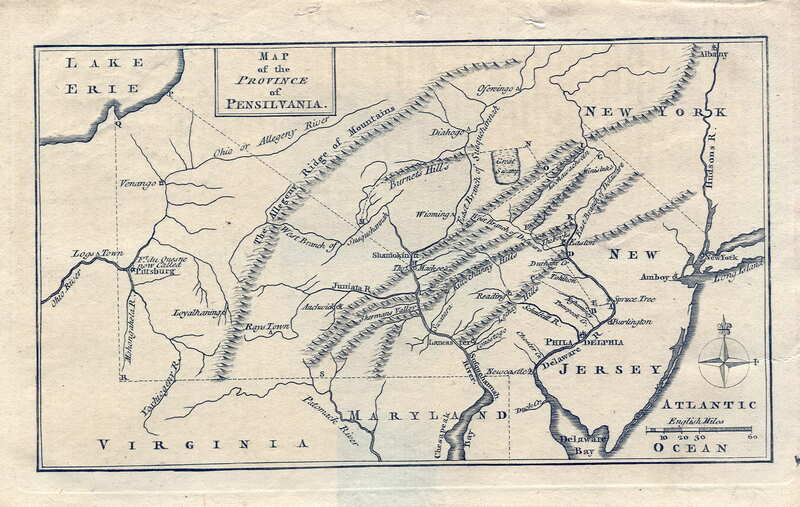 Russell's book contains other regional maps of similar title which do not include Pennsylvania. Longitude is west from London. Blank verso. Scale: 1 inch = 105 miles. Size: 8 x 10 inches. 1778.29 (Delaware River) There are two untitled manuscript maps in the Pennsylvania Archives (Record Group 27) attributed to French engineer Jean Louis Ambrose Villefranche, and dated 1778. The catalog title is DELAWARE RIVER DEFENSE. 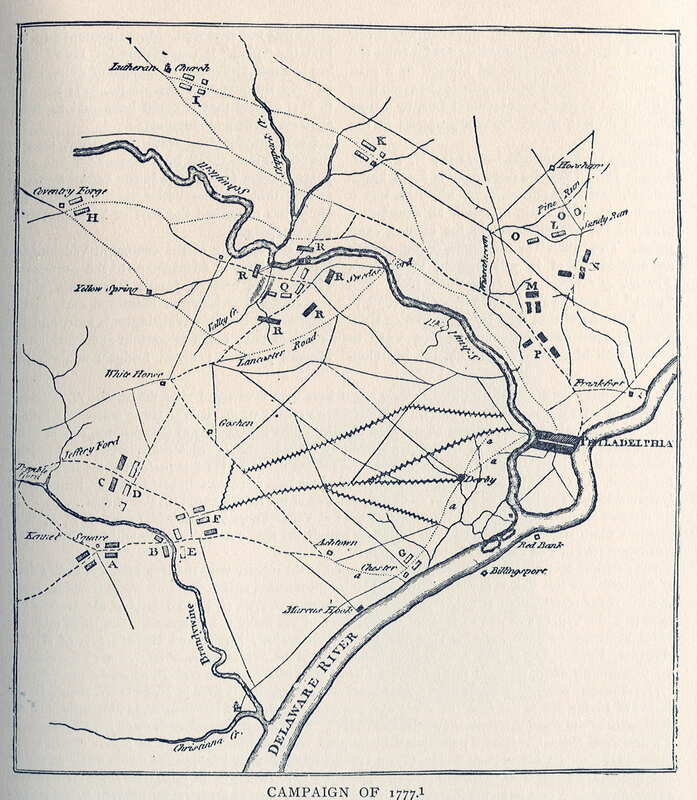 The maps show fortifications along the Delaware River south of Philadelphia including Hog Island. See Docktor #278V4, 279V8; also Guthorn #47. A reproduction with discussion of one map is on pages 178-179 in Shirk. 1778.30 BRITISH CAMP ON WEST BANK OF SCHUYLKILL RIVER AT PHILADELPHIA. An anonymous and undated manuscript map of the Philadelphia area in the Clements Library, see Docktor #27_A5.0A. 1778.31 (Southeast Pennsylvania) An untitled, anonymous and undated manuscript map in the Clements Library showing southeast Pennsylvania, see Docktor #27_A5; also #27_A7 for a possibly related manuscript map of Philadelphia. 1778.32 PLAN OF WASHINGTON'S POSITION. Mr Parker, late a mercht in Virginia, now in Philadelphia. An undated manuscript map in the Clements Library showing the area west of Philadelphia and Valley Forge, see Docktor #27_P5. 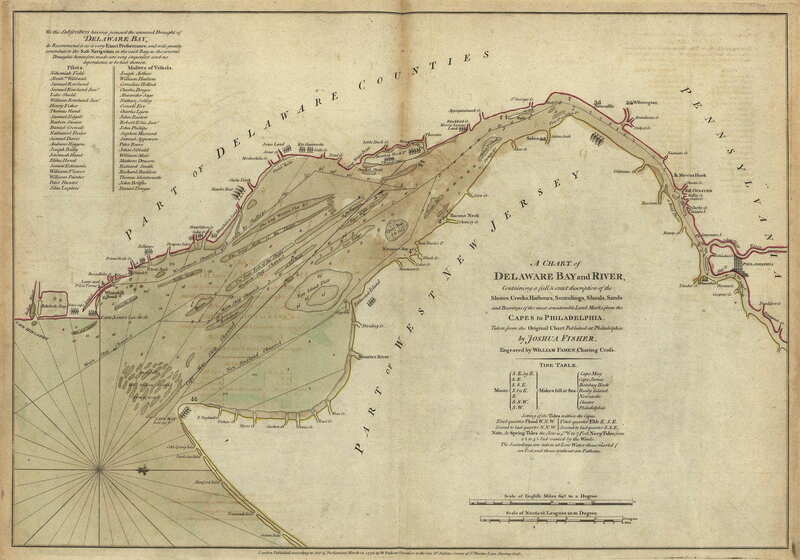 1778.33 KENSINGTON TO MUD ISLAND, an anonymous manuscript map in the Scavenius Collection of Dartmouth College. Docktor #278A6. 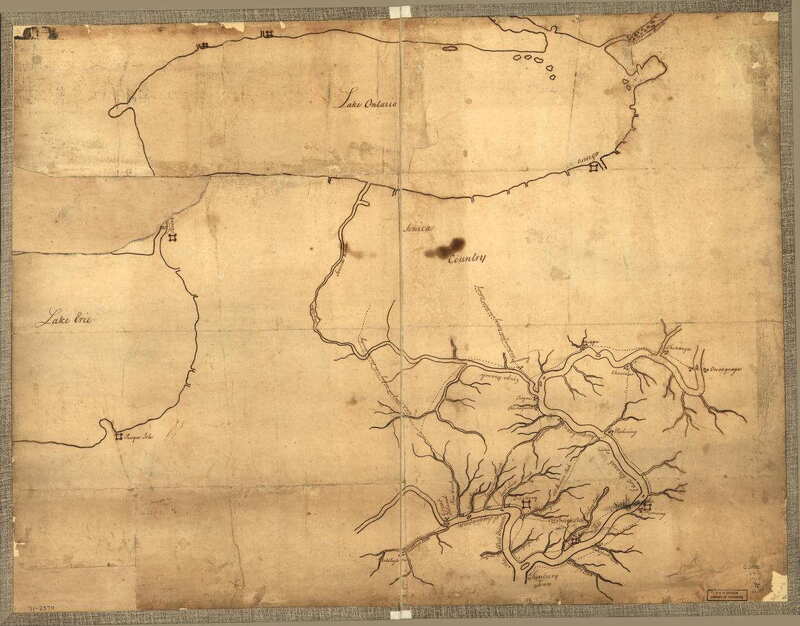 1778.34 (Lancaster County) An untitled anonymous manuscript map in the Erskine-DeWitt collection of the New York Historical Society, number 130, shows a "Road from Little Britain Meetg. Ho. to Peach Bottom Ferry." See Robert Erskine below. Docktor #278E5. 1778.35 PLAN OF THE REDOUBTS NEAR PHILADELPHIA 1ST APRIL 1778. A manuscript survey map of the British lines; held at Harvard Library and listed in Guthorn (#51-D1). 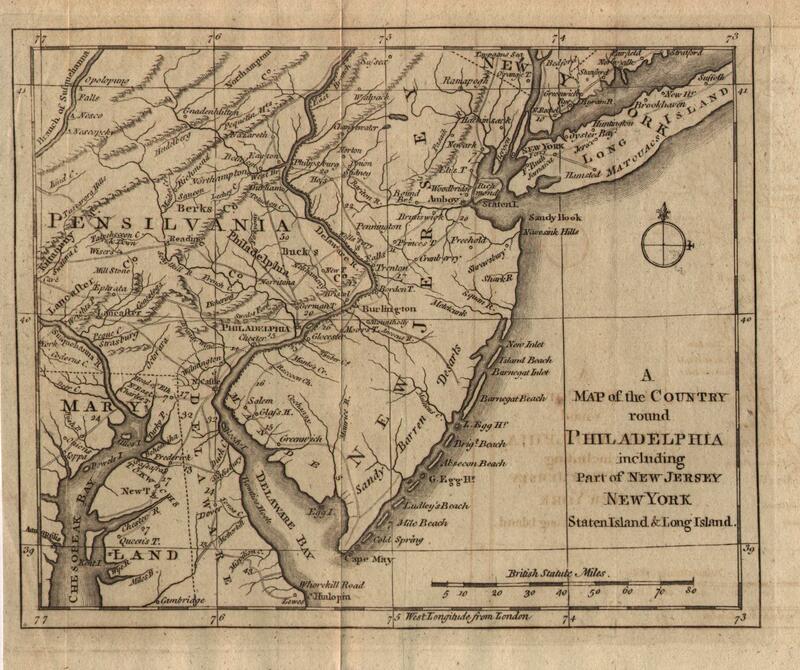 1778.36 A MAP OF NEW JERSEY, PENNSYLVANIA, NEW YORK, MARYLAND & VIRGINIA from the latest and best Surveys. This map appeared in An Impartial History of the Present War in America. London and Newcastle, 1778-80, three volumes. Guthorn (1972) #170-4. 1778.37 BRITISH CAMP ON WEST BANK OF THE SCHUYLKILL RIVER AT PHILADELPHIA. By: Sir Henry Clinton. An undated manuscript map in the Clinton papers at Clements Library; see Guthorn (1972) #21. 1778.38 A COMPLETE PLAN OF PART OF THE PROVINCE OF PENNSYLVANIA, EAST AND WEST JERSEY SHEWING THE TRANSACTIONS OF THE ROYAL ARMY UNDER THE COMMAND OF THEIR EXCELLENCIES SIR W. HOWE AND SR. HY. CLINTON...This plan is compiled from the original surveys of Scull, Biddle, Fisher, Cox, Millage, Dennis, Williams, Morgan, Rue, Clinton, Ryartson, & several principal surveyors by I. Hills, vol. with the Brigade of His Majestys Foot Guards. New York August 1778. This is a large (20 x 62 and 20 x 22 inches) two part manuscript map held at the Clements Library. John Hills also produced two related maps which appeared in Faden's Atlas of Battles of the American Revolution: A PLAN OF PART OF THE PROVINCES OF PENNSYLVANIA, AND EAST & WEST NEW JERSEY..., and SKETCH OF THE SURPRISE OF GERMANTOWN, BY THE AMERICAN FORCES...; see Guthorn (1972) #57-5,6,7. Hills was a prolific draughtsman who worked under Montresor and produced a large number of Revolutionary War maps and sketches, Guthorn has 51 entries for him. 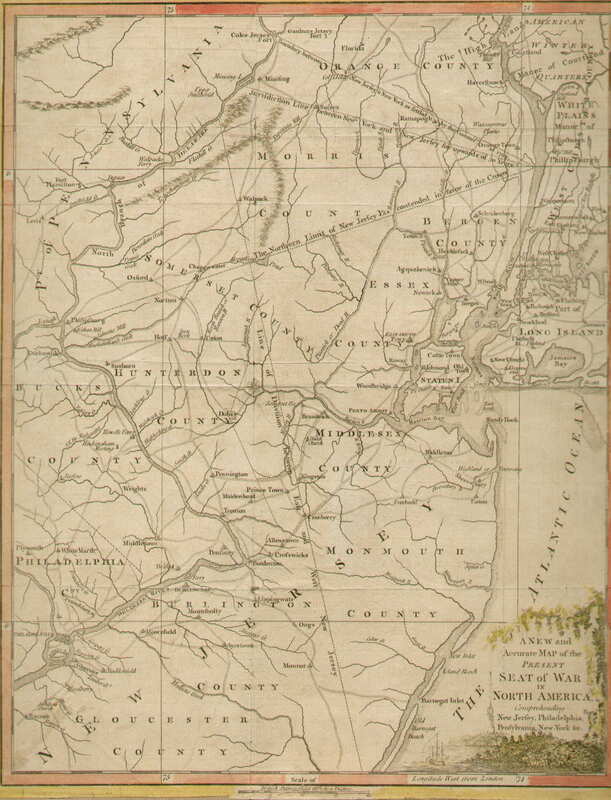 1778.39 (Delaware River) A manuscript map in the Huntington Library is attributed to George Spencer, a colonial Loyalist. It shows the ship channel, islands and fortifications. Guthorn (1972) #106-1. 1778.40 A DRAUGHT AND CALCULATIONS OF AN ENTRENCHMENT FROM DELAWARE TO SCHULKILL RUN IN ANGLES TO THE BEST ADVANTAGE THE GROUND WILL PERMIT. An undated manuscript map circa 1777-78 apparently drawn as a Philadelphia fortification guide and attributed to Montresor by Guthorn (1972) #80-25; original in the Atwater Kent Museum, Philadelphia. 1778.41 DRAUGHT OF THE RIVER DELAWARE FROM CHESTER TO PHILADELPHIA, Engraved for Moore's New and Complete Collection of Voyages and Travels. This map appears on a sheet with four other harbor maps titled Various Plans and Draughts of Cities, Towns, Harbours &c Drawn from the Latest Authorities, engraved by Thomas Conder. 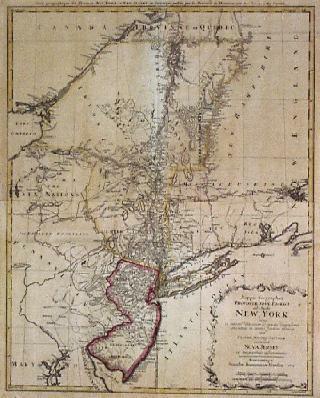 The maps are: Plan of the Harbour of New-York and Parts adjacent, The Town & Harbour of Boston &c., Draught of the River Delaware from Chester to Philadelphia (this map), Plan of the Harbour of Charles Town, South Carolina, and Plan of the City & Harbour of Havana, Capital of Cuba. Each map includes city plans, islands, channels and more. The sheet appears in A new and complete collection of voyages and travels: containing all that have been remarkable from the earliest period to the present time... with an account of the rise and progress of navigation among the various nations of the earth... comprehending an extensive system of geography, describing, in most accurate manner, every place worthy of notice in Europe, Asia, Africa, and America... by John Hamilton Moore; London, Printed for the proprietors and sold by A. Hogg, 1778. The Library of Congress has two listings for Moore's Travels, 1778 and 1785. This map was also seen at auction dated 1784 from Millar’s New Complete and Universal System of Geography. Sellers & van Ee #189. No longitude markings, this copy is discolored. Scale: 1 inch = 3.5 miles. Size: 2.75 x 4 inches. 1779.1 MAP OF THE EUROPEAN SETTLEMENTS IN NORTH AMERICA, by Thos. Kitchin, Hydrographer to His Majesty, from A Philosphical and Political History of the Settlements and Trade of the Europeans in the East and West Indies, by Abbe Raynal, Dublin, 1779 per page 590 of Phillips (McCorkle #779.9). The complete map covers the eastern part of North America from Greenland to Florida with settlement confined to the eastern seaboard. Philadelphia and Ft. Duquesne appear. In the Great Lakes region and westward are numerous Indian names. 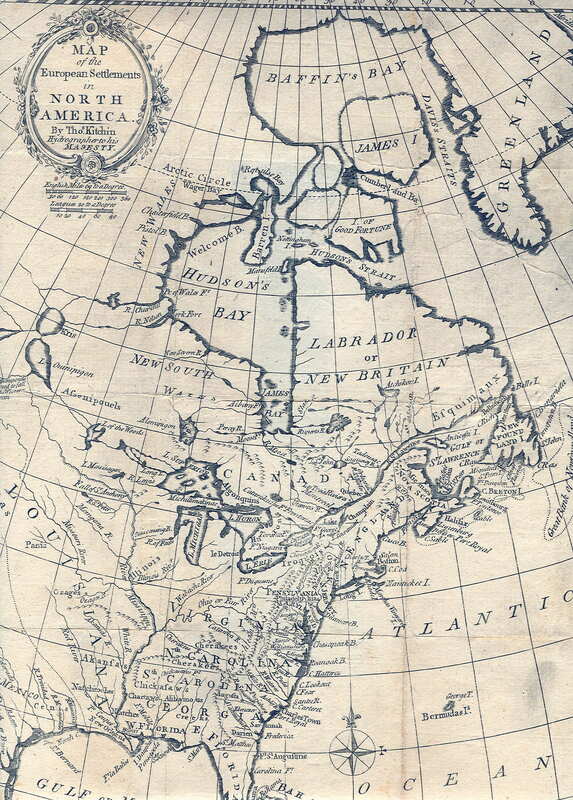 A comment by L. Ouinipigon alludes to the northwest passage: 'R. of ye Assenpouels supposed to fall into the Western Ocean'. The map has a garland style title cartouche and compass rose at bottom and was originally folded. Although McCorkle's dating is followed here, an earlier version of this map dates to 1776 from a London edition of Raynal's work published by T. Cadell. That map has the date 1776 at the bottom, missing on this later printing. Longitude is west from London at the bottom, west from Ferro at top. Blank verso. Scale: 1 inch = 320 miles. Size: 13.5 x 12 inches. 1779.2 THEATRE DE LA GUERRE EN AMERIQUE, avec les Isles Antilles; projette et assujettie aux observations, par Mr. Bonne hydrographe du Roi... 1779. This is a later version with a different title of map 1771.2. McCorkle #779.2, Sellers & van Ee #165. 1779.3 COLONIE INGLESI. This is a small Italian playing card map of uncertain date showing the northeast; little is named and nothing in Pennsylvania. McCorkle (#779.5) provides a few details and references. 1779.4 CARTE DU THEATRE DE LA GUERRE PRESENTE EN AMERIQUE dressee d'apres les Nouvelles Cartes Anglaises. par L. Denis geographe et auteur du Conducteur Francais Dediee et presentee a Monsieur Le Noir.... Basset en 1779. A map extending from Newfoundland to Florida, but only as far west as Lake Michigan. There is a large inset of southern New England and New York, eastern Pennsylvania and all of New Jersey. The boundaries shown for the colonies are way out of date, no western Maryland, Pennsylvania extended to Lake Ontario, etc. McCorkle #779.6; Sellers & van Ee #737. 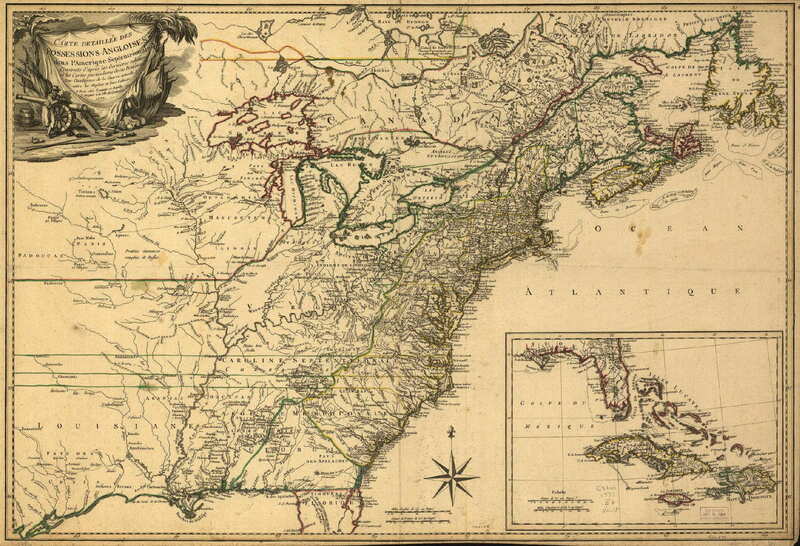 1779.7 A NEW MAP OF NORTH AMERICA. A version of Mitchell's 1755 map of the usual region from Newfoundland to Florida and west to beyond the Mississippi, from The History of the War in America, Dublin 1779-85. Pennsylvania extends to 43 degrees with its western boundary a mirror image of the eastern. There was also a 1780 London edition. McCorkle #779.10, 780.13; Sellers & van Ee #169. 1779.8 A PLAN OF THE CITY AND ENVIRONS OF PHILADELPHIA, with the works and encampments of His Majesty's forces under the command of Lieutenant General Sir William Howe, K. B. Engraved and published by Wm. Faden. London, 1779; this map appears in Faden's Atlas of Battles of the American Revolution. The Library of Congress also has an untitled manuscript draft of this map dated to 1778 attributed to Pierre Nicole. Sellers & van Ee #1326-27, Phillips page 700, M. P. Snyder, Figure 59. This is possibly related to the manuscript map listed in Docktor #278A7. 1779.9 (Southeastern Pennsylvania) An untitled map showing proposals for improving the inland navigation in Pennsylvania and Maryland by opening a communication between the tide-waters of Delaware and Chesapeak bay. In the Transactions of the American Philosophical Society, 2nd ed. corrected. v. 1. p. 367, R. Aitken & son, Philadelphia 1779. Phillips page 677. 1779.10 THE COURSE OF DELAWARE RIVER FROM PHILADELPHIA TO CHESTER with the several Forts and Stackadoes raised by the Rebels... Published by W. Faden... March 20th. 1779. 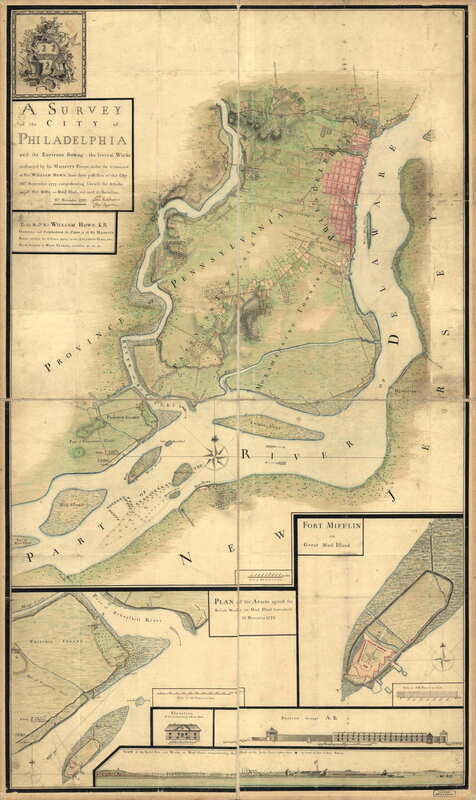 This is a detailed view of the river with an inset of Mud Island probably based on other maps of the Delaware listed here. Illustrated on pages 124-25 of Nebenzahl & Higginbotham. 1779.11 PLAN DEL AFFAIRE DE BRANDEISEIN gagne le 11 (Sept) 1777 par l'Armee Britanique sous les ordres du General Howe sur les Rebelles. 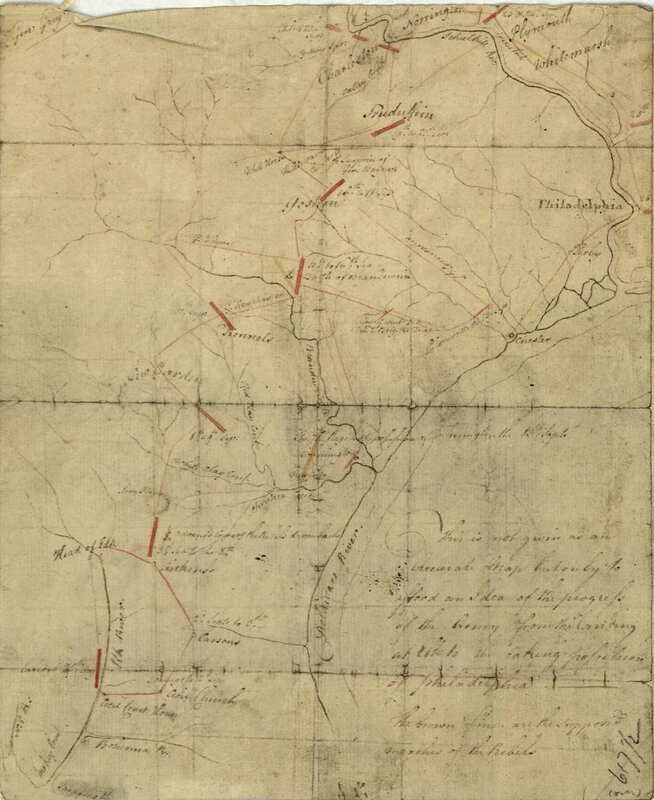 This manuscript map depicts the battle of the Brandywine showing troop positions during the battle in September, 1777, to stop Howe. The map was prepared in 1779 by Reinhard Jacob Martin, who was the mapmaker for the Hessian army fighting with the British. Illustrated on pages 52-53 of Marshall & Peckham. 1779.12 CARTE DU THEATRE DE LA GUERRE DANS L'AMERIQUE, pendant les années 1775, 76, 77 et 78 : où se trouvent les principaux camps avec les différentes places et époques des batailles qui sont données pendant ces campagnes, gravée d'après le dessein original qui a été présenté au Roi, fait par le Sr. Capitaine du Chesnoy, officier français ... servant dans l'armée américaine. Chez Perrier graveur : Chez Fortin ingénieur méchanicien. This French map of the Revolutionary War was probably published in 1779. It covers the northeast from Maryland to New Hampshire and includes eastern Pennsylvania. The image here is from the Library of Congress. 1779.13 MAP OF GEN. SULLIVAN'S MARCH FROM EASTON TO THE SENACA & CAYUGA COUNTRIES. This untitled and anonymous manuscript map bears this pasted on title given by the Library of Congress from where this image comes. It shows the topography along the Delaware from Easton up into New York. Docktor #279A3, Guthorn #51-B2. 1779.14 PLAN OF THE OPERATIONS OF THE BRITISH AND REBEL ARMY IN THE CAMPAIGN, 1777, by J. Lodge. This map appeared in Letters to a Nobleman on the Conduct of the War in the Middle Colonies, by Joseph Galloway; printed for J. Wilkie, London 1779. There is an untitled facsimile in Winsor which is shown here. A second map in Galloway is titled A PLAN OF MUD IFLAND FORT WITH ITS ENVIRONS. It has an accompanying legend identifying points at the mouth of the Schuylkill. See also Docktor #277A2, #277L6. 1779.15 (Fort Mifflin, Mud Island) An untitled, though apparently engraved map by D. Chillas, 1779, in the Library of Congress showing the attack on Mud Island. Docktor #279C5. 1779.17 PLAN GENERAL DES OPERATIONS DE L'ARMEE BRITANNEQUE CONTRE LES REBELLES DANS L'AMERIQUE Depuis L'Arriveé des Troupes Hessoises le 12 du Mois d'Aoust 1776 Jusquà la fin de L'Année 1779; by Charles Auguste de Gironcourt, 1779. A manuscript map in the Library of Congress showing the region from West Point south to Maryland with considerable detail of troop movements, camps, etc. Docktor #279G6. 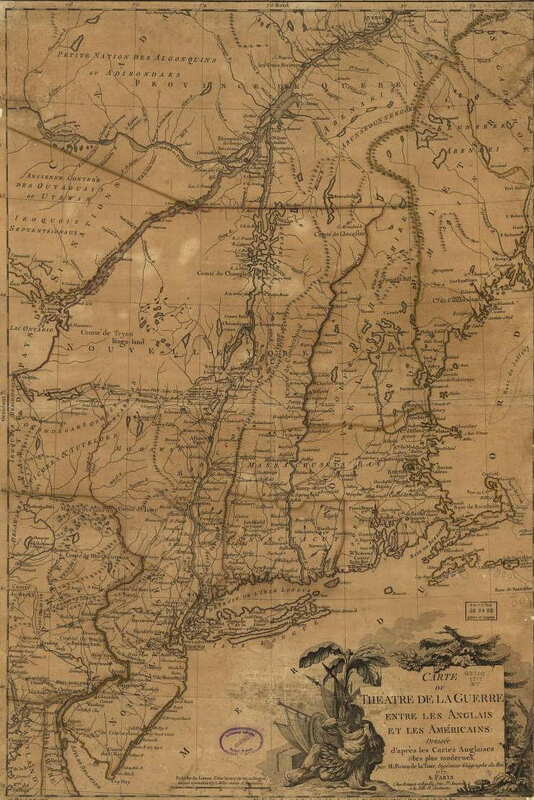 1779.18 (Robert Erskine) A collection of manuscript road maps, most held by the New York Historical Society, are attributed to Robert Erskine. A number of these dated to 1779 show roads in Pennsylvania as listed in Guthorn #17. See #1778.35 above and the map below also. 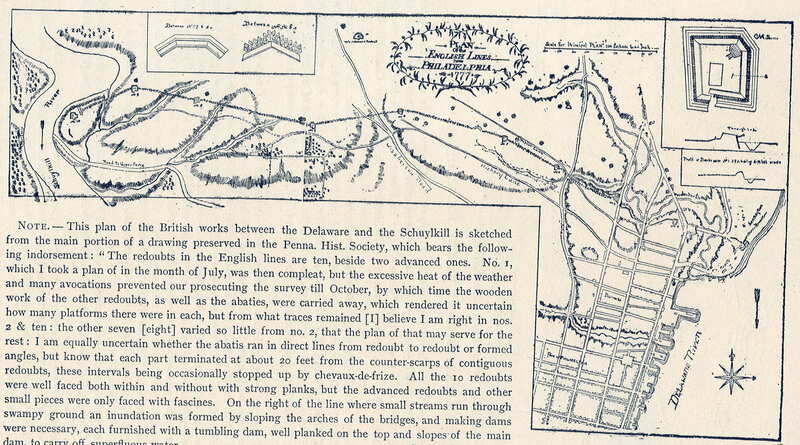 1779.19 A PLAN OF THE RIVER SCHUYLKILL WHEREIN ARE LAID DOWN THE SEVERAL SHOALS WITH THE DEPTH OF WATER AT EACH IN INCHES, also the depth of the channel in general in the beginning of August 1773. Together with the means proposed for improving the navigation of sd river and an estimate of the expense. Copied from the original plan of David Rittenhouse Esqr by Robt. Erskine F.R.S. 1779. A long manuscript strip map about 15 x 147 inches with an inset of the Norristown area. Guthorn #39. 1779.20 (Bensalem Township, Bucks County) An untitled manuscript survey map of the Joseph Galloway Tract held in the Pennsylvania Archives, Record Group 27. There are many surviving manuscript survey maps like this and this one is only listed because it is reproduced on page 181 in Shirk. © Copyright 2000-2009 by Harold Cramer. All rights reserved.